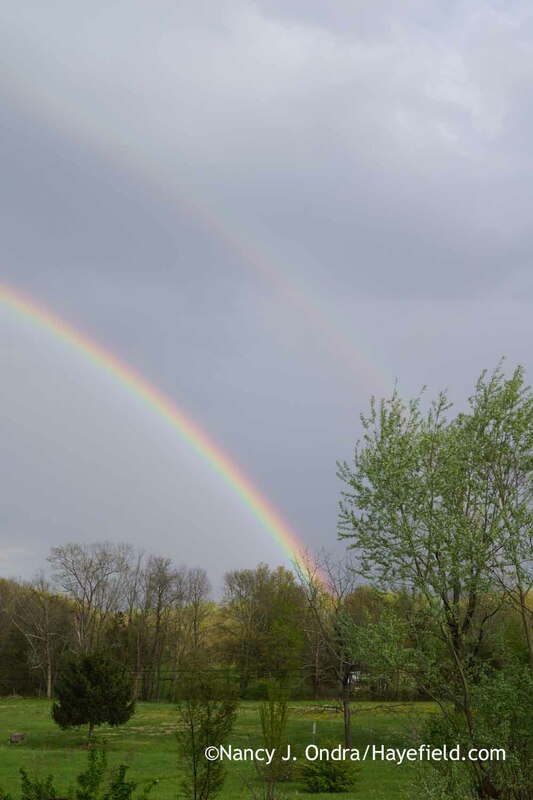 After a speedy start, spring in our part of Pennsylvania has slowed considerably, due to several weeks of cool, damp weather. It’s nice in a way, as the flowers that are opening are lasting a long time, and there’s lots of lush new foliage to admire too–so much, in fact, that I’ll try to keep the chat to a minimum and focus on the interesting stuff, beginning with the wild things. A trip into the meadow starts with a close encounter with the gelatinous masses of cedar-apple rust (Gymnosporangium juniperi-virginianae). A lot of them. They’re particularly icky on rainy days, of which we have had many. 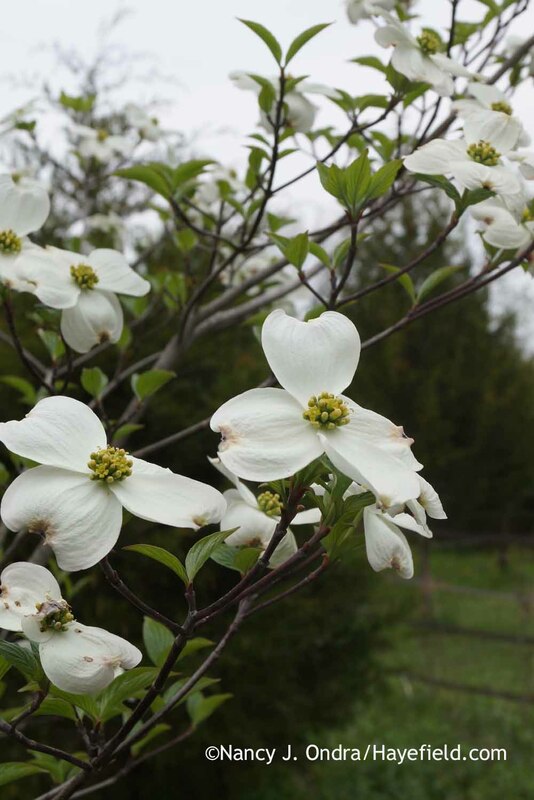 After that daunting greeting, the meadow path reveals much prettier sights, such as this self-sown flowering dogwood (Cornus florida). Foxglove penstemon (Penstemon digitalis) typically has green leaves, but a bunch of these dark-leaved variants are seeding around in the upper meadow. 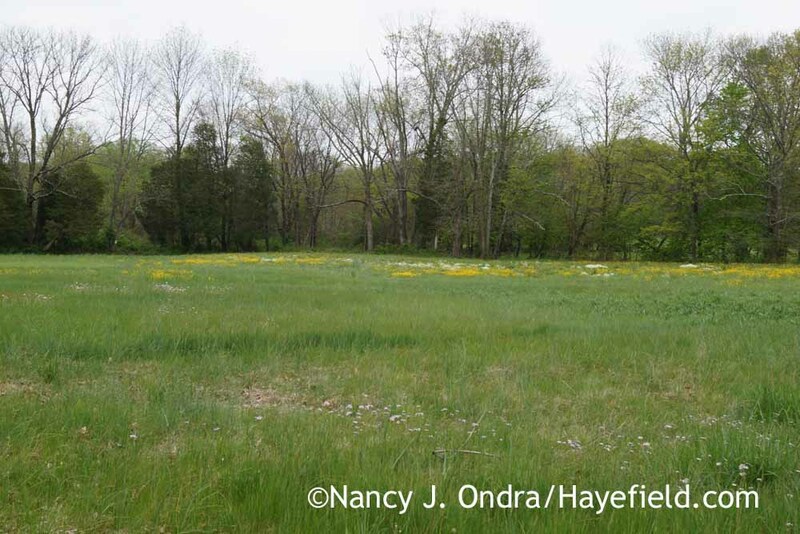 Much of the lower field is just green grasses of various sorts, but those drifts of color in the distance were tempting enough to lure me down to that wetland area. 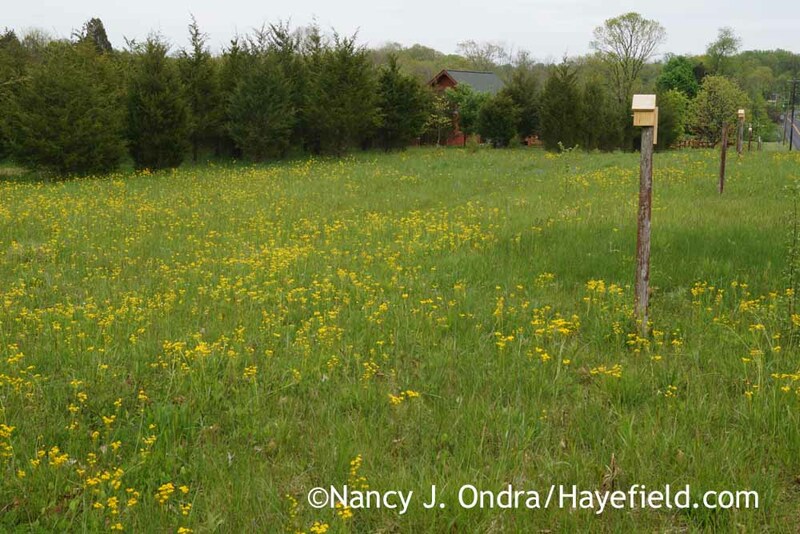 The yellow in that field turned out to be the same as in my upper meadow: the charming daisy-form flowers of golden ragwort (Packera aurea [formerly Senecio aureus]). 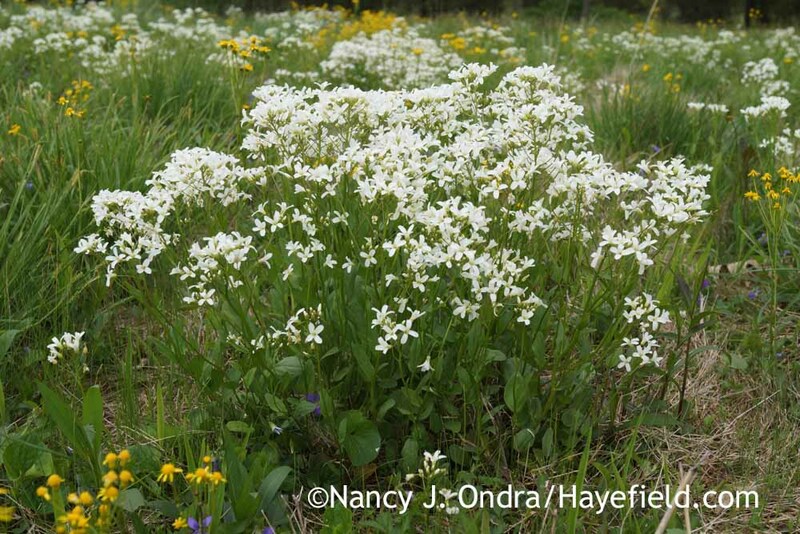 The white flowers were a new find for me: bulbous bittercress (Cardamine bulbosa)–a rather ugly name for a lovely spring wildflower. I can’t believe that I never noticed these before! 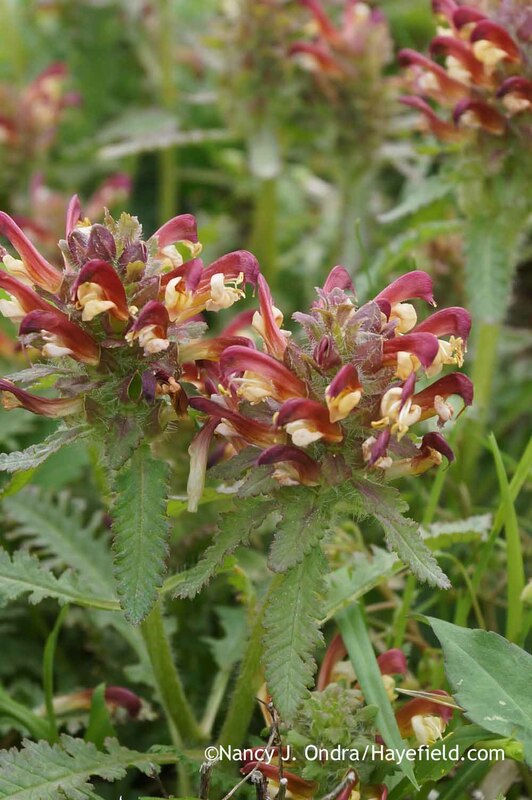 An even more intriguing find was a wildflower that I haven’t seen around here in many years: Pedicularis canadensis. 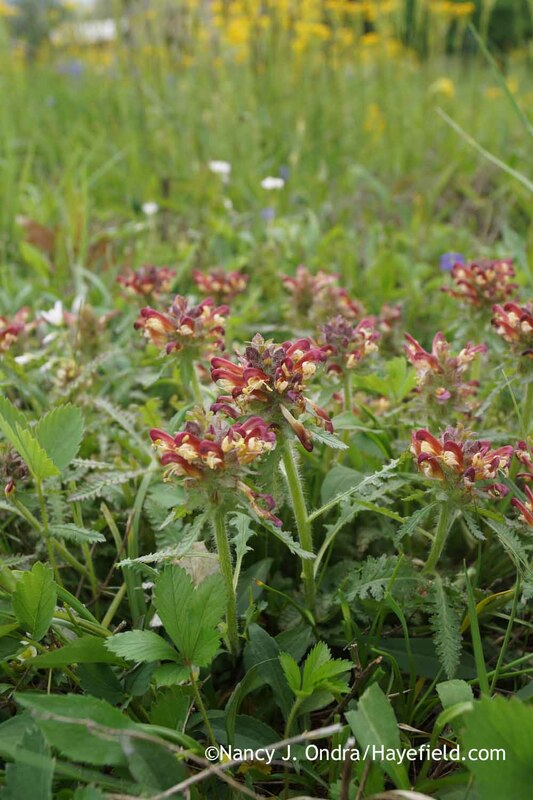 It’s most often known by the unappealing name of Canadian lousewort but is sometimes called wood betony. 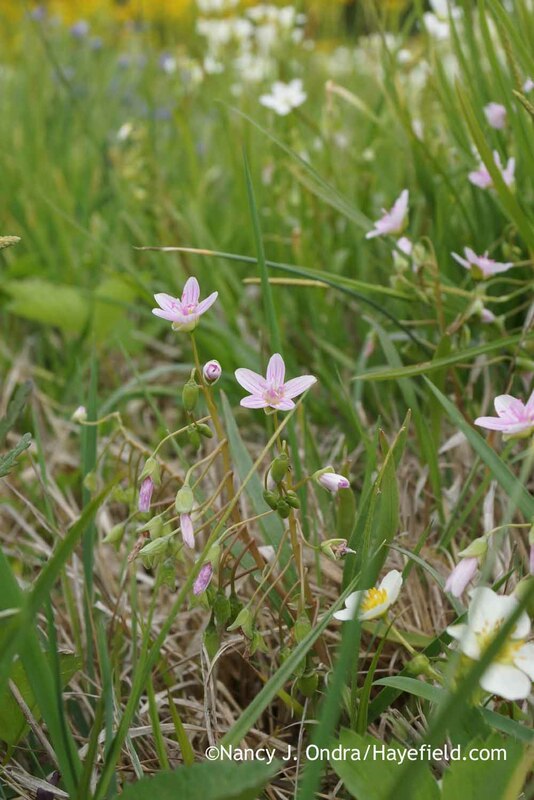 The plant is technically a hemiparasite–partially parasitic on other plants–but apparently can also live on its own. 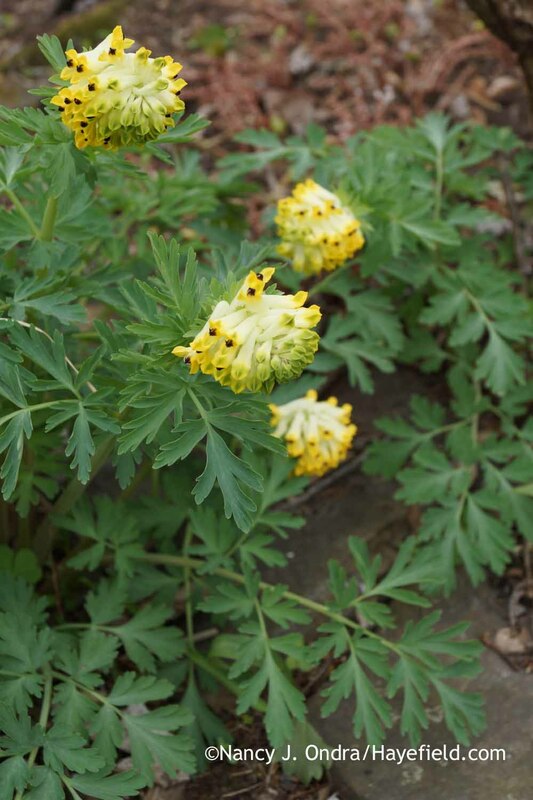 Whether they are solid yellow or bicolored like these, the flowers of Canadian lousewort (Pedicularis canadensis) are so distinctive that you can’t confuse them with other spring wildflowers. 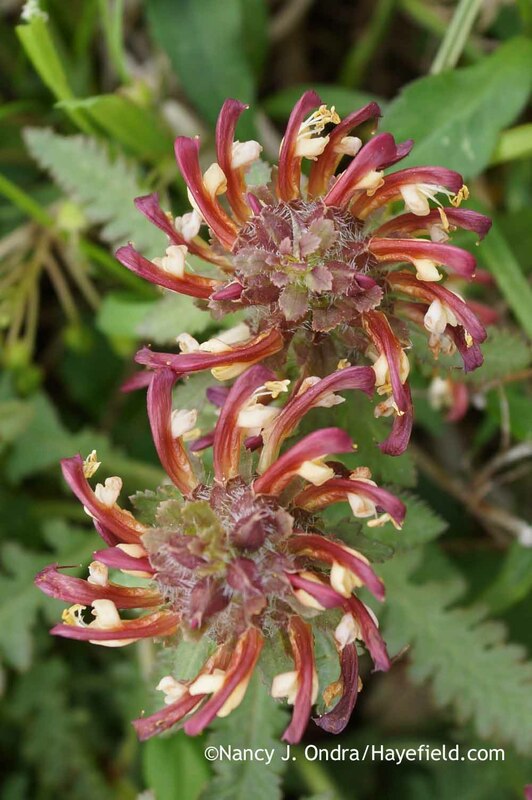 Viewed from above, the flowerheads of Canadian lousewort (Pedicularis canadensis) have a fascinating spiral form. 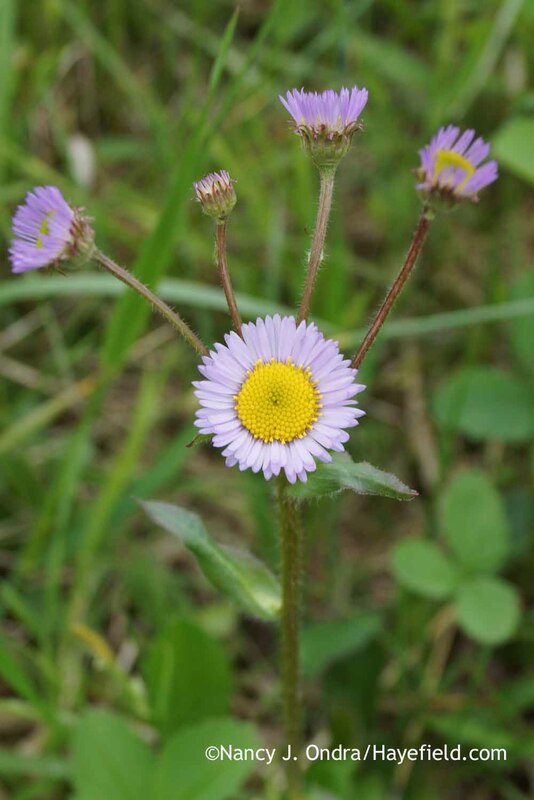 This has also been a particularly good year for robin’s plantain (Erigeron pulchellus), also known as robin’s fleabane. 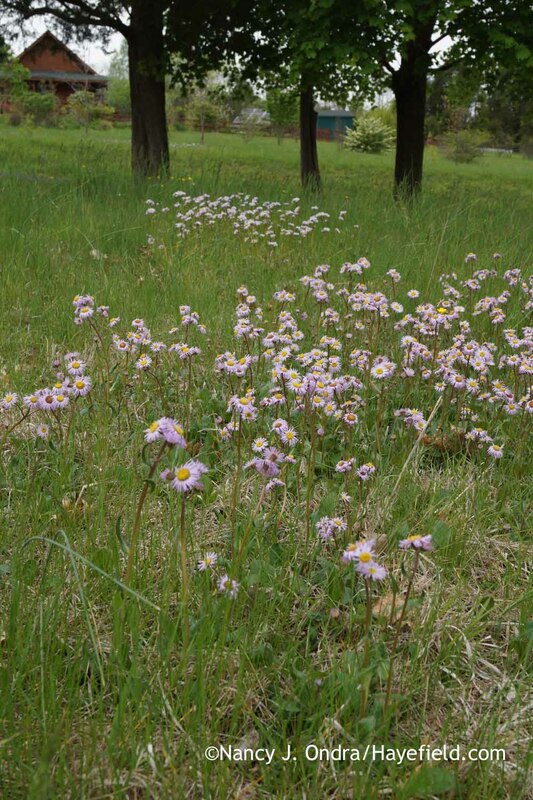 The color is often white or pink, but there are also some nice purples in the lower meadow areas. 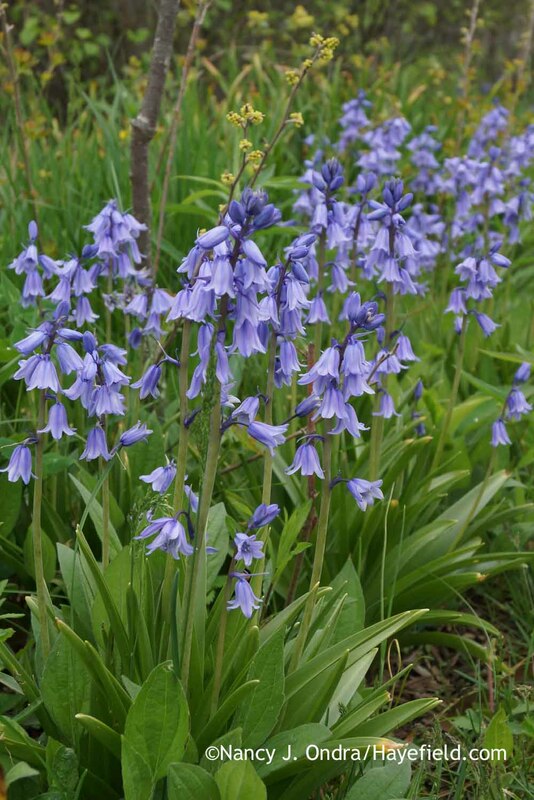 I normally pull the plants out of my borders, because they can spread quickly, but I’m almost tempted to bring a few of these into my cottage garden. 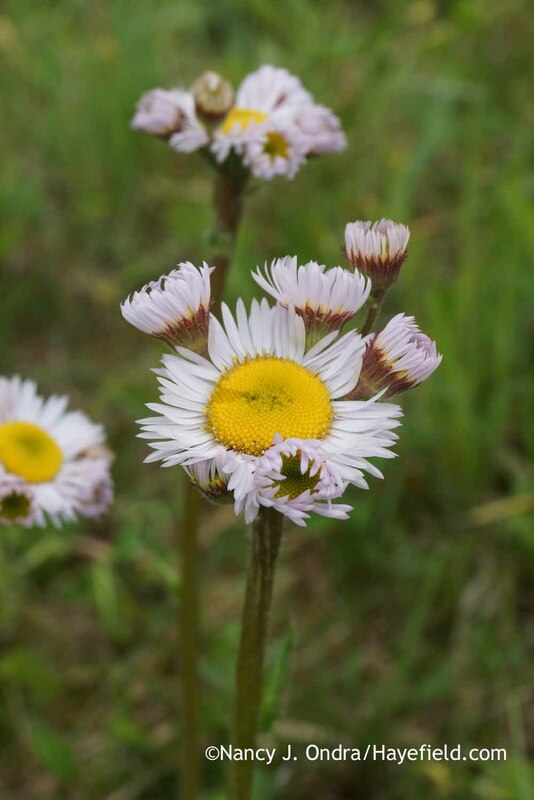 The flower form of these robin’s plantain (Erigeron pulchellus) plants is very similar to that of hens-and-chickens calendula (Calendula officinalis var. proliferans). Not all robin’s plantain (Erigeron pulchellus) plants branch like this one–but my goodness, doesn’t it look festive? Whee! 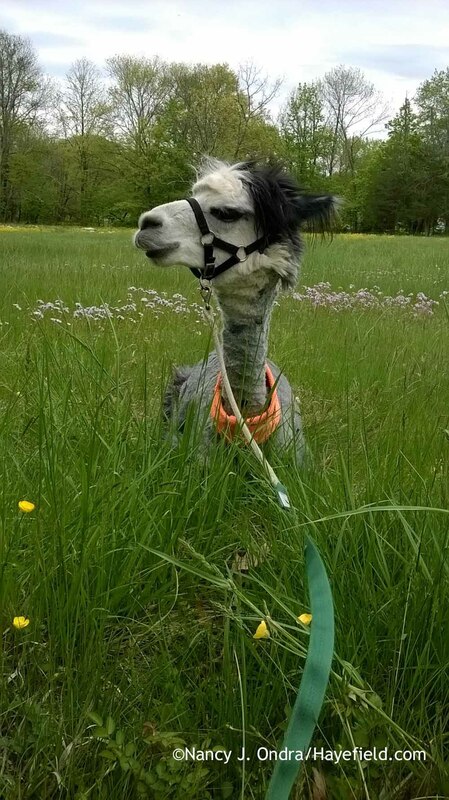 This flower-filled meadow is also one of the boys’ favorite places to hang out before we head back to the barn after a ramble. Back in the garden, there are lots of beautiful blooms too. Here’s a bunch of highlights, in no particular order. 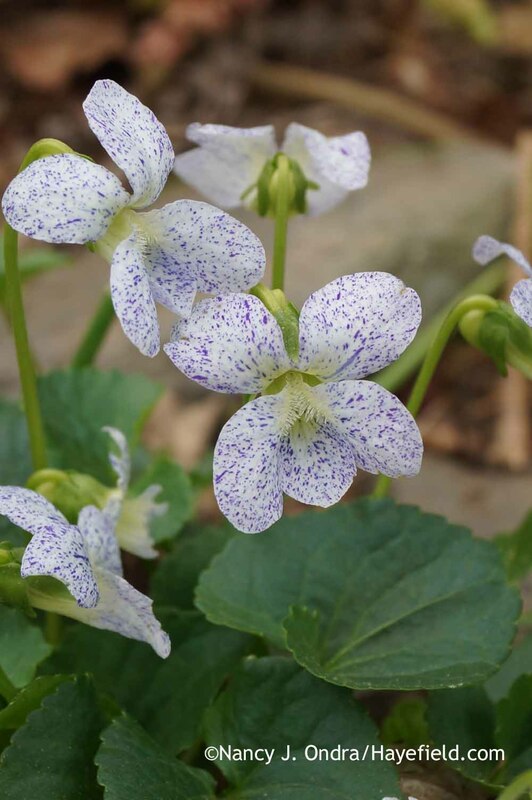 ‘Freckles’ is a form of common or woolly blue violet (Viola sororia). I started the original plants from seed once, decades ago, and they’ve been around ever since, self-sowing as freely as the species. 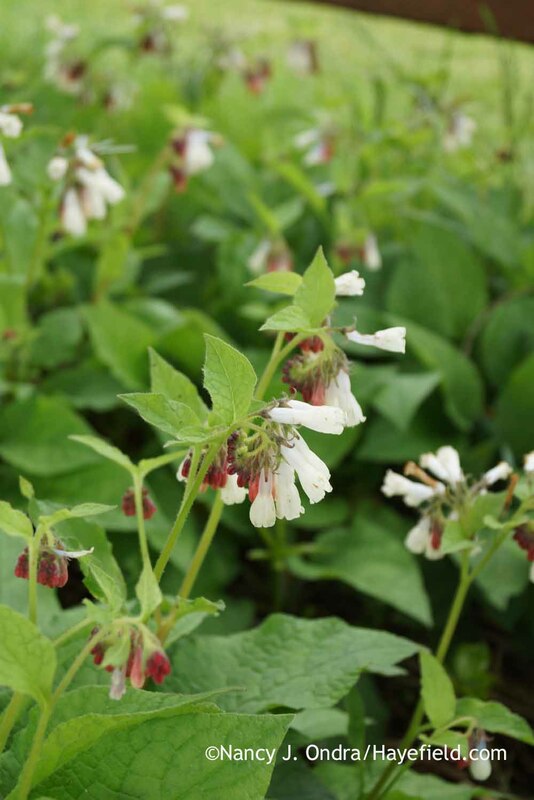 Dwarf comfrey (Symphytum grandiflorum) looks dainty in bloom, but it’s a tough plant, forming a dense groundcover even in dry shade. 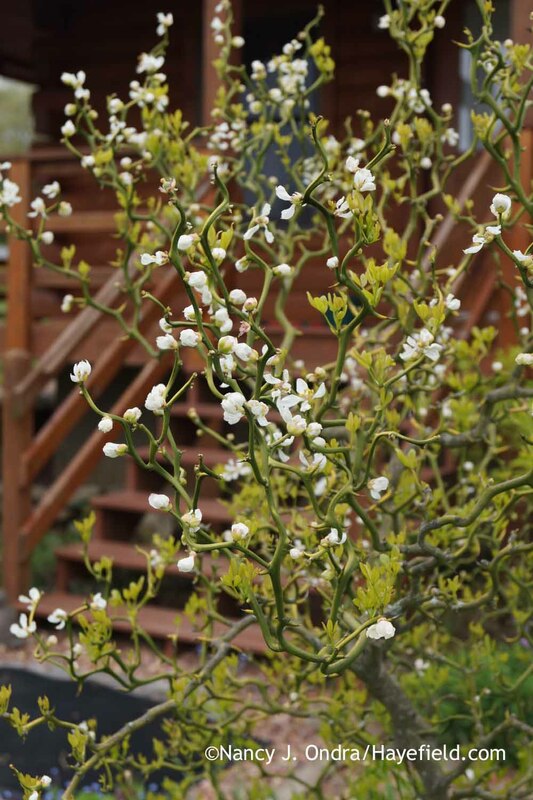 This patch is growing and thriving in the root-filled soil under my silver willow (Salix alba var. sericea). 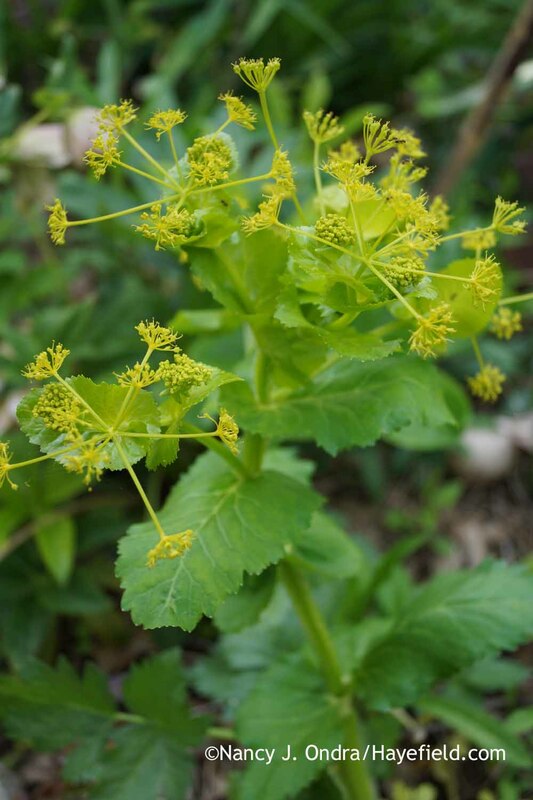 I was thrilled to find this golden Alexander (Smyrnium perfoliatum) plant in bloom, because I thought all of my plants had flowered, seeded, and died last spring, and I figured I’d have to wait several years to see flowers from their offspring. But now that I have this one in bloom, I’ll be able to collect and sow more seed this year. 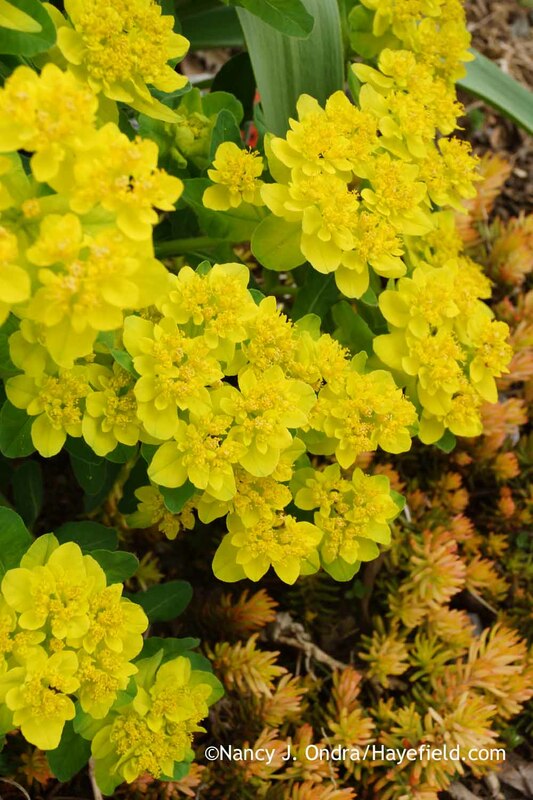 Woodland sedum (Sedum ternatum) can grow pretty much anywhere, from sun to shade and in moist or dry soil. Now that I’ve seen ‘Ravenswing’ cow parsley (Anthriscus sylvestris) seeding around rampantly in a garden where it was left unsupervised, I now understand why it’s considered a potential problem. I deadhead most of my plants but leave just a few flower clusters so I can collect seed to share. I’d really miss the ferny dark foliage if I got rid of it altogether. 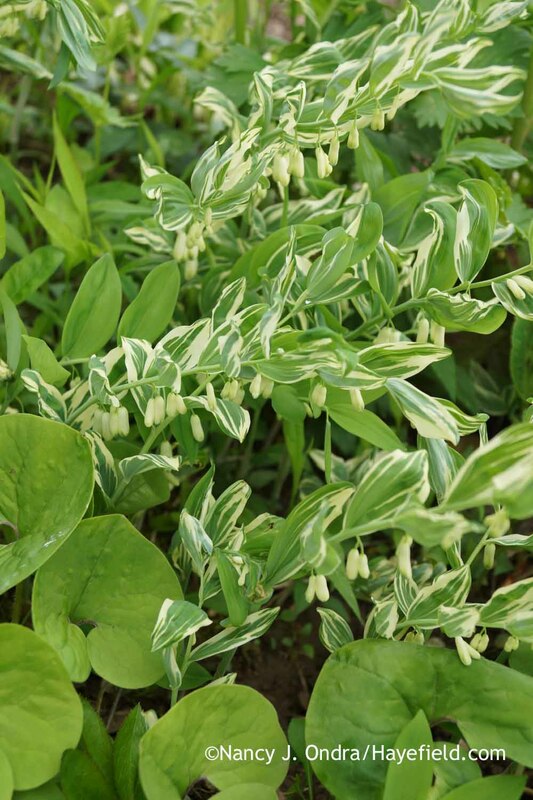 Here it’s with variegated Solomon’s seal (Polygonatum odoratum ‘Variegatum’). 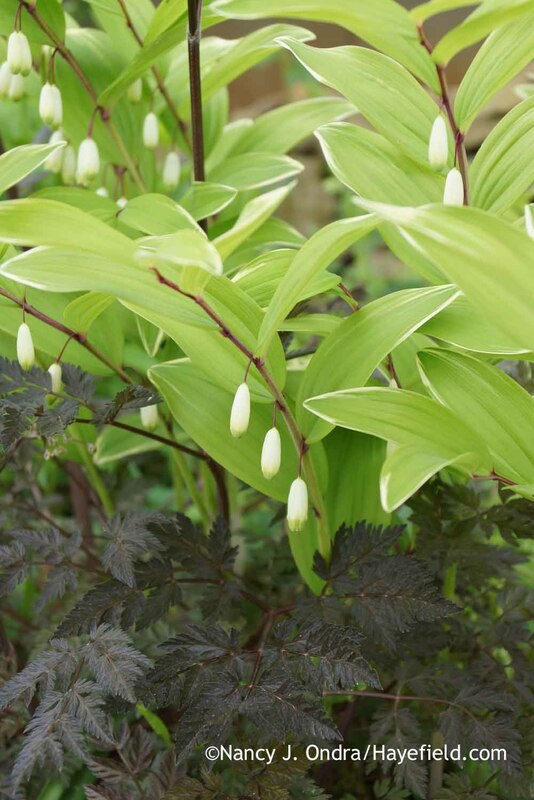 This even-more-vividly-variegated Solomon’s seal (Polygonatum x hybridum) is sometimes sold as ‘Striatum’ but also travels under other names, including ‘Grace Barker’. 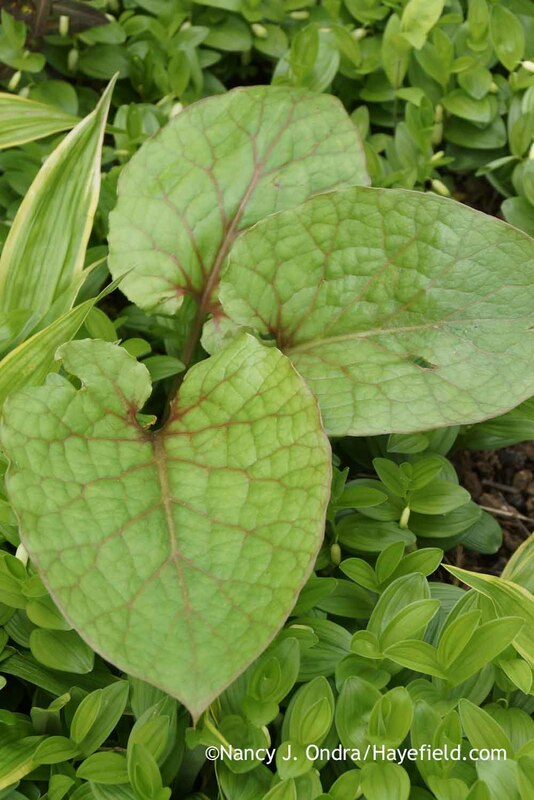 It looks great coming up through low, solid-green groundcovers, such as Canada wild ginger (Asarum canadense). 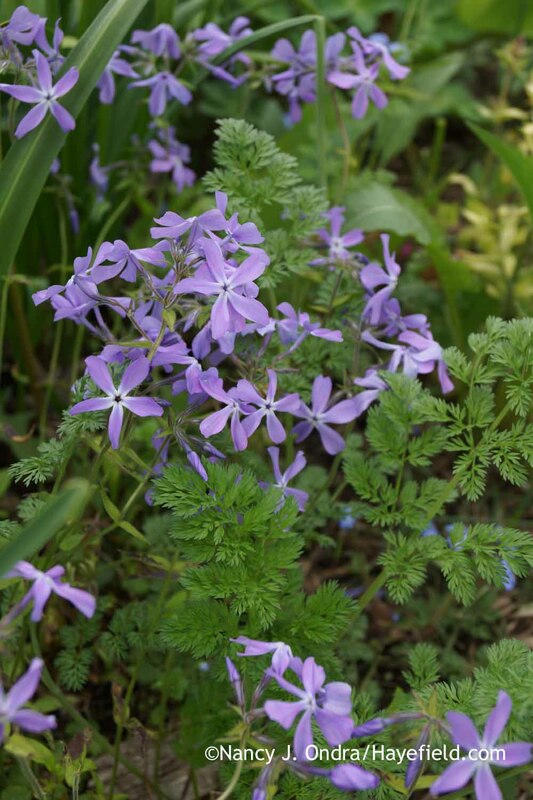 I’ve had a bit of trouble getting woodland phlox (Phlox divaricata) established here, since I don’t have much shade, but ‘Clouds of Perfume’ has managed to settle in and keeps getting better each year. It looks like it’s been infiltrated by Queen Anne’s lace (Daucus carota), but that feathery foliage is actually from the annual white lace flower (Orlaya grandiflora), which should be in bloom by the time the phlox is finished. 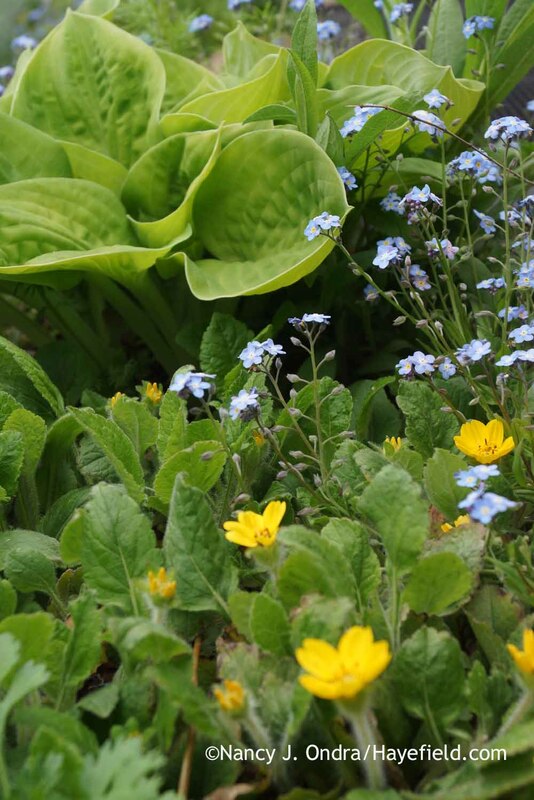 It wouldn’t be spring without a few forget-me-nots (Myosotis sylvatica)! Well, ok, it’s hard to have just a few, once you let them go to seed a few times, but I’m happy to have them wherever they appear. 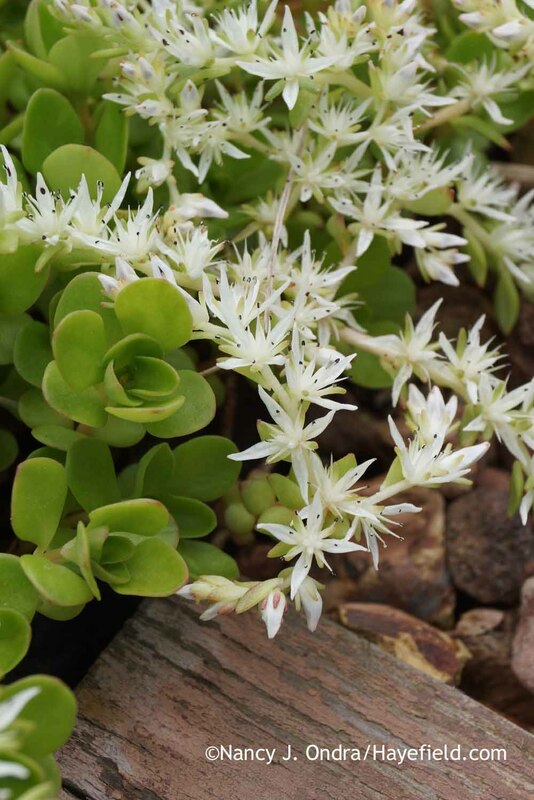 This clump placed itself nicely in a carpet of ‘Angelina’ sedum (Sedum rupestre). 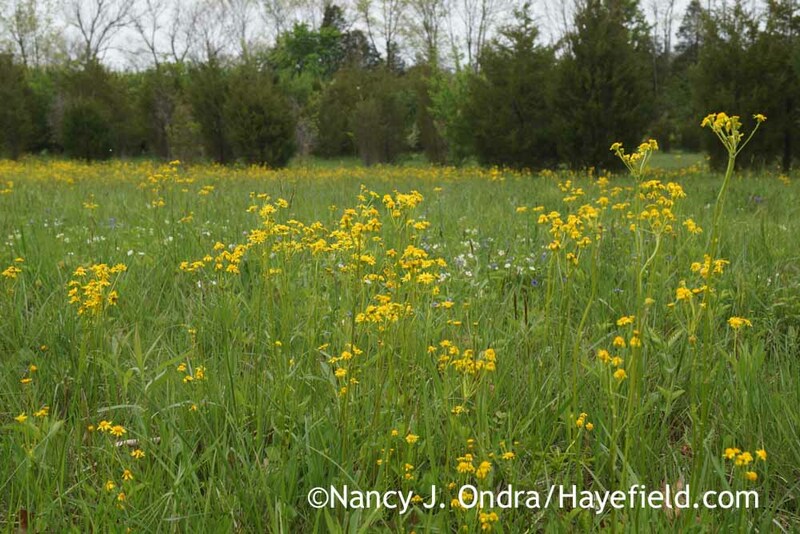 Remember the golden ragwort (Packera aurea [Senecio aureus]) in the earlier meadow shots? 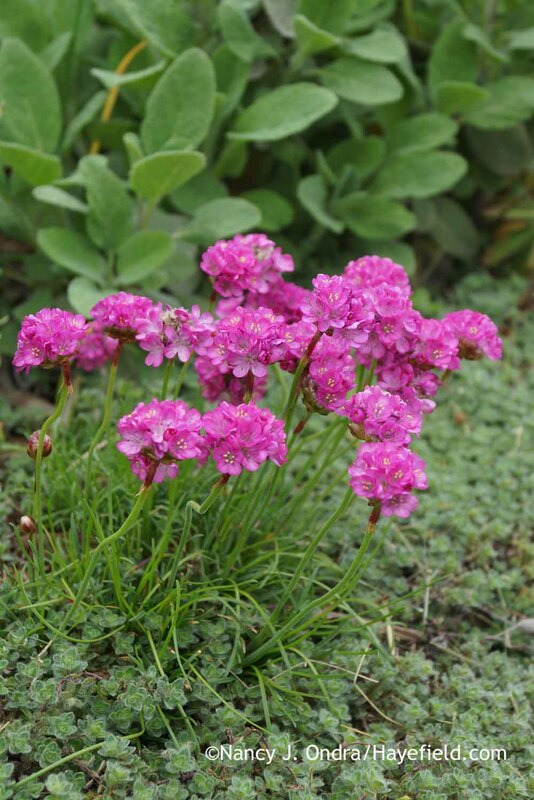 In the garden, where there is less competition, this sturdy native wildflower can form handsome, dense clumps. Dyer’s woad (Isatis tinctoria) seeds around freely too, to the point that this non-native biennial or short-lived perennial is considered a noxious weed in some areas. I let only a few seeds form on mine–just enough to have replacement plants. 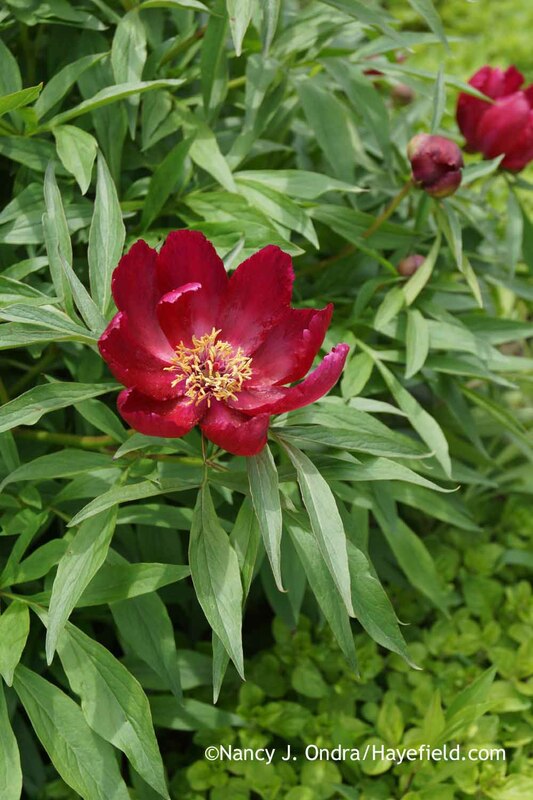 Another plant that I grew from seed, but there’s no danger of it ever becoming weedy: Paeonia officinalis. 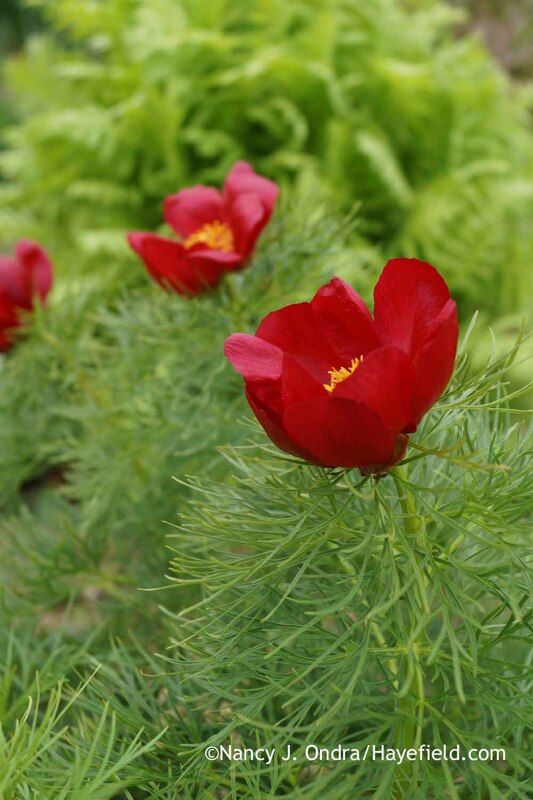 Yet another beautiful species: fernleaf peony (Paeonia tenuifolia). 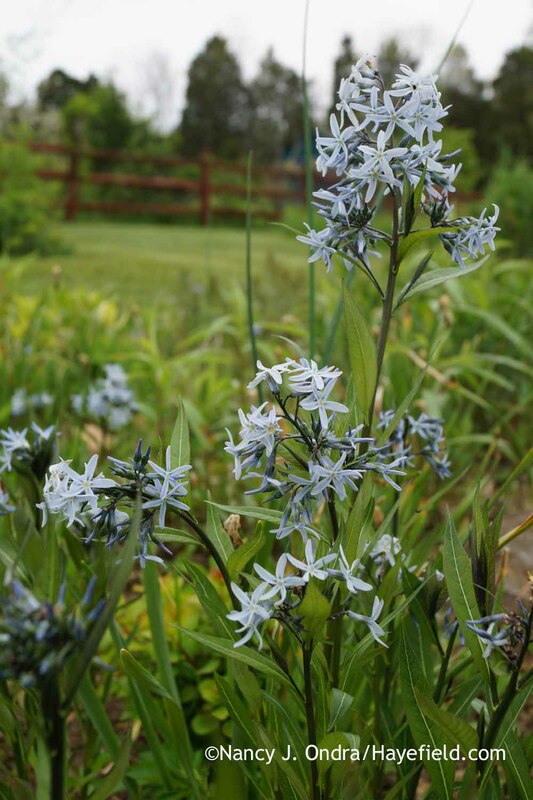 Stiff bluestar (Amsonia rigida), shown here, starts flowering about a week before Arkansas bluestar (Amsonia hubrichtii) and two weeks before hybrid ‘Blue Ice’. 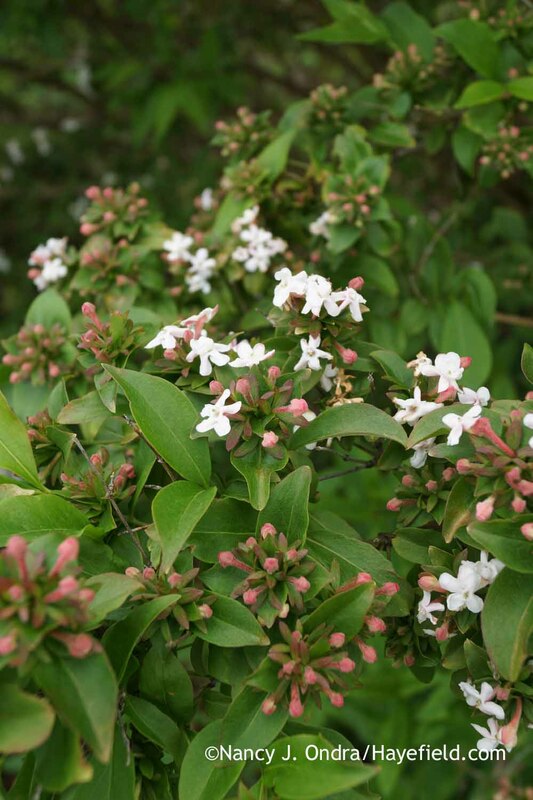 The richly scented flowers of fragrant abelia (Abelia mosanensis) began opening just a few days ago but already fill the cottage garden with their perfume. 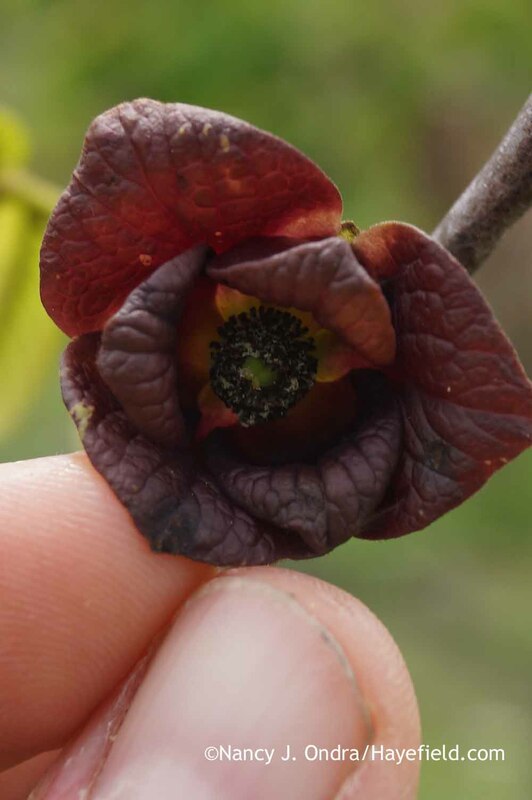 I’m thrilled that my pawpaw (Asimina triloba) seedlings are finally old enough to start producing multiple flowers! 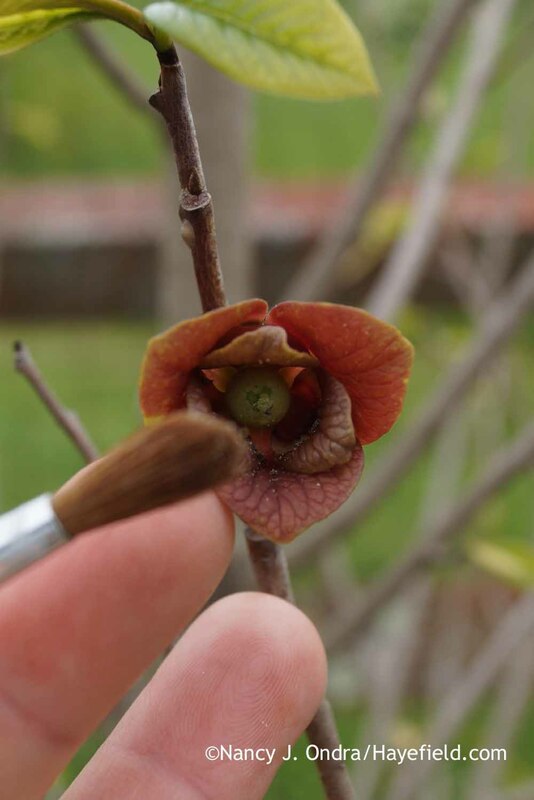 I was able to collect pollen from the male parts on one pawpaw seedling a few days ago. 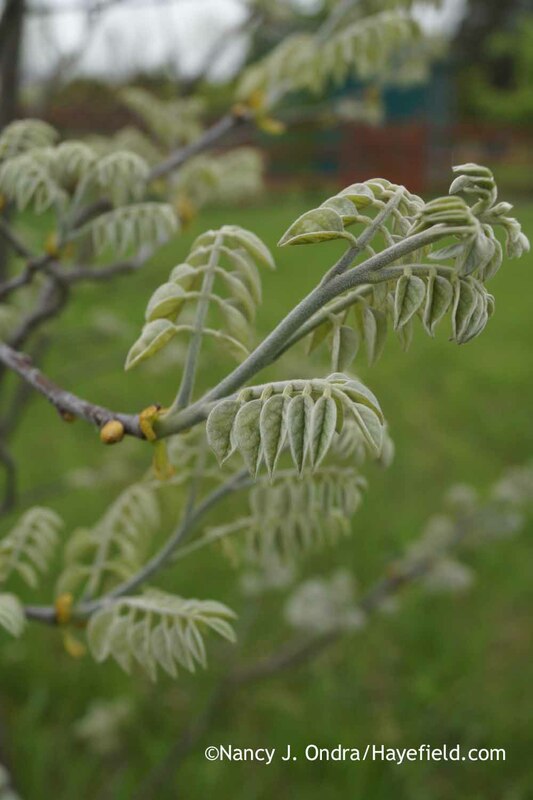 Two flowers on another pawpaw seedling were at the right stage for pollination. I guess I’ll know by next month whether I did a good job playing bee (or in this case, fly, as flies are the common pollinator). 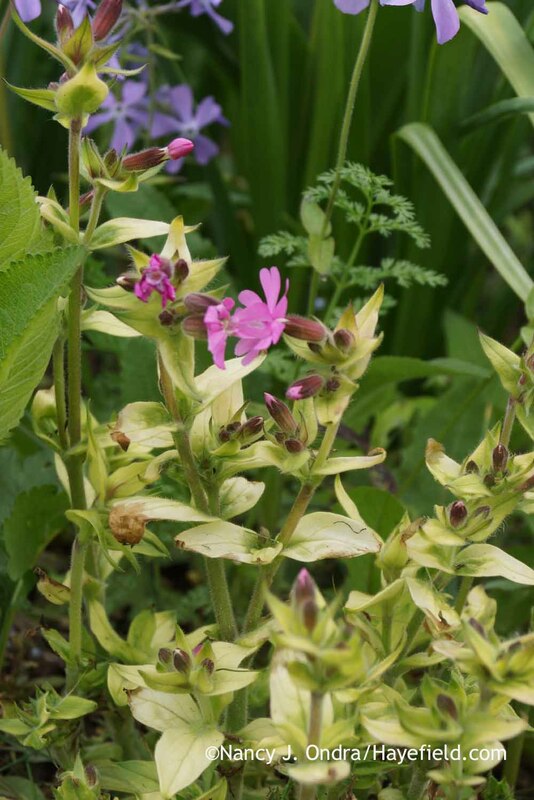 Speaking of pollination…last year, someone mentioned that their ‘Ray’s Golden Campion’ (Silene dioica) plant wasn’t setting seed. 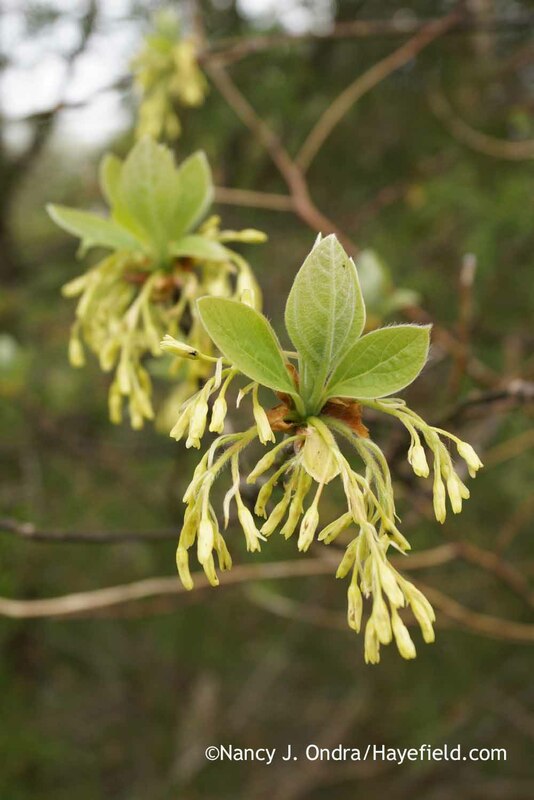 That led me to research what should have been immediately obvious from the specific epithet dioica, for dioecious. Now that I’m aware that there are both male and female plants, I’ve found several ways to tell them apart. 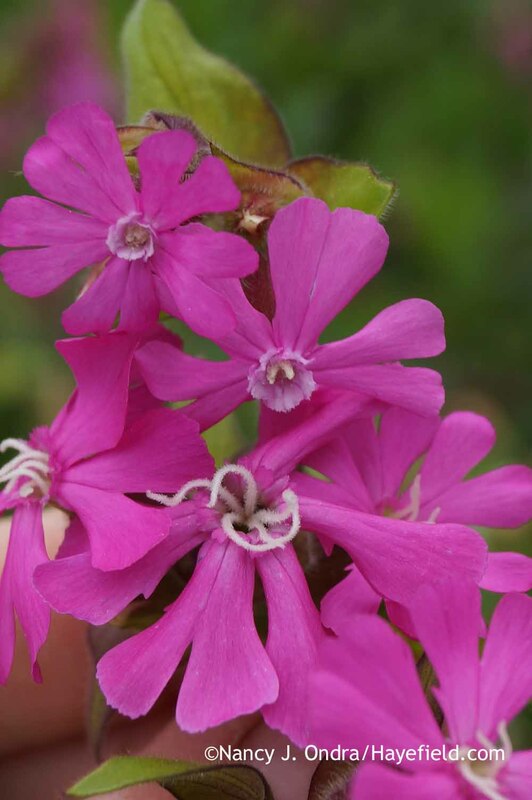 The most straightforward way to identify male and female plants of red campion (Silene dioica) is to take a close look at the flowers. The females are below, with two male blooms above. 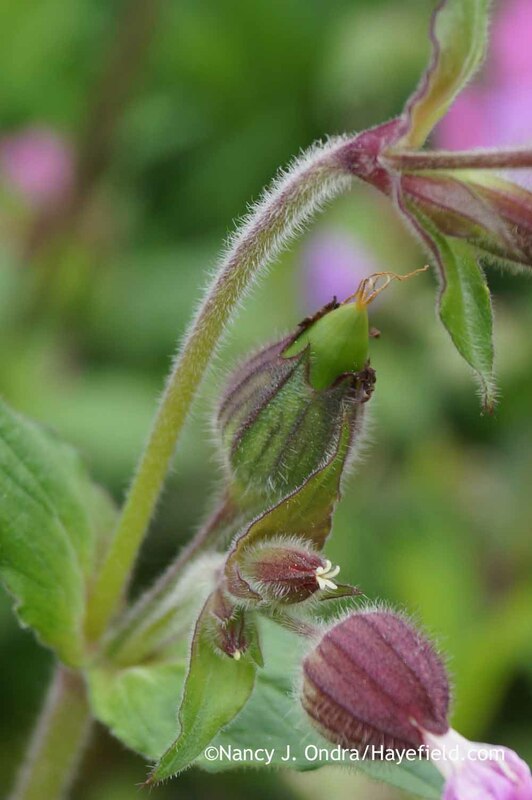 Seeing a developing seed capsule is another obvious clue that a particular red campion (Silene dioica) plant is female. 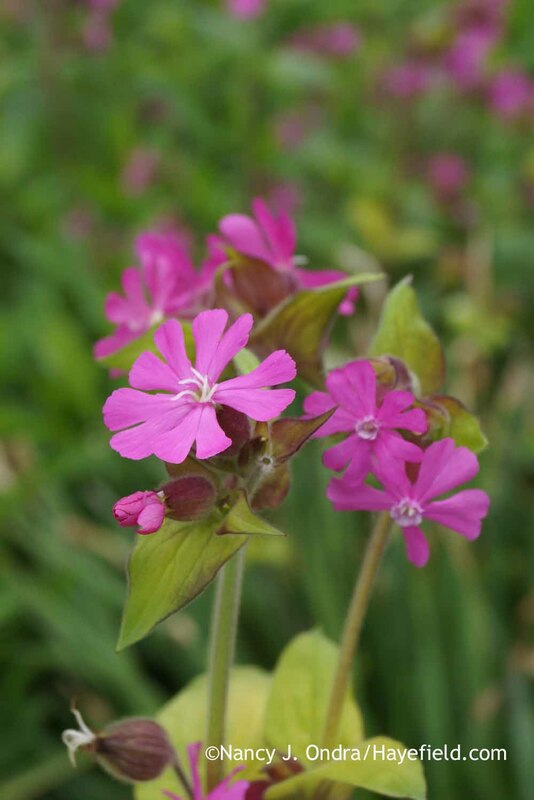 If you have a number of red campion (Silene dioica) plants growing together, you may also be able to tell the males from the females from a bit of distance. 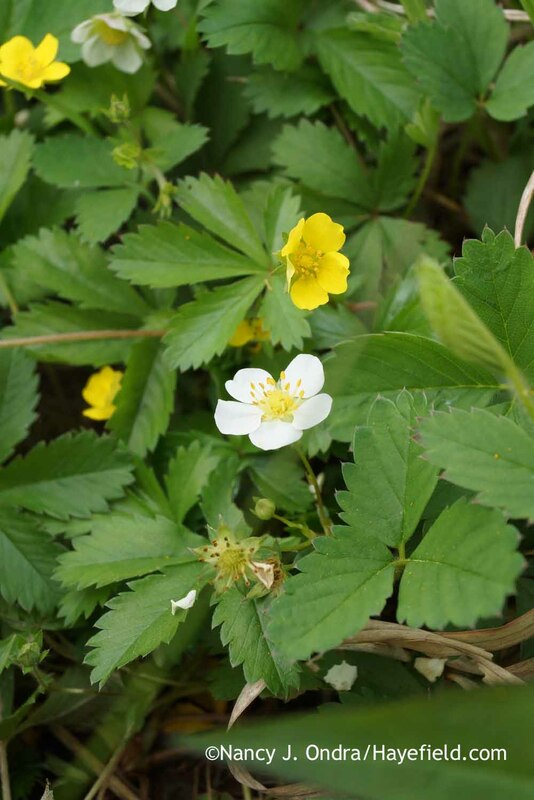 The males (on the right) tend to have thinner stems and smaller but more abundant blossoms, though that’s not always the case. 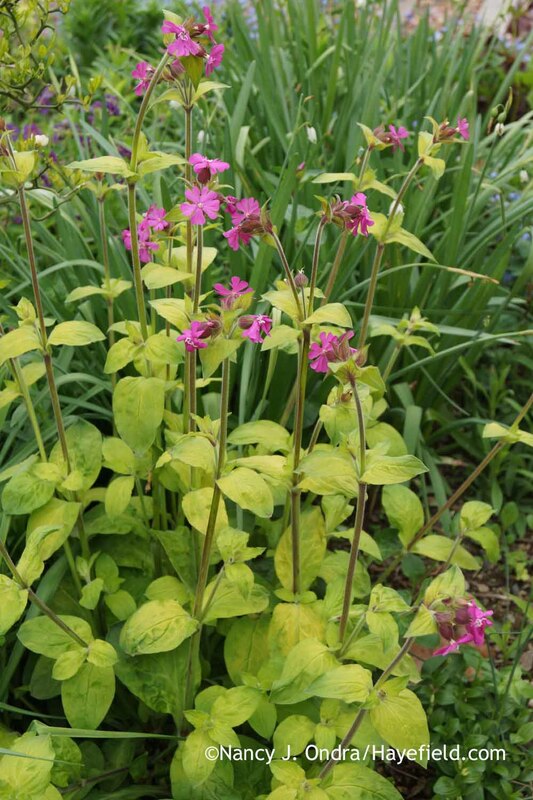 Female plants of red campion (Silene dioica) make more of a foliage impact, which is a bonus on strains with showy leaves, like this ‘Ray’s Golden Campion’. 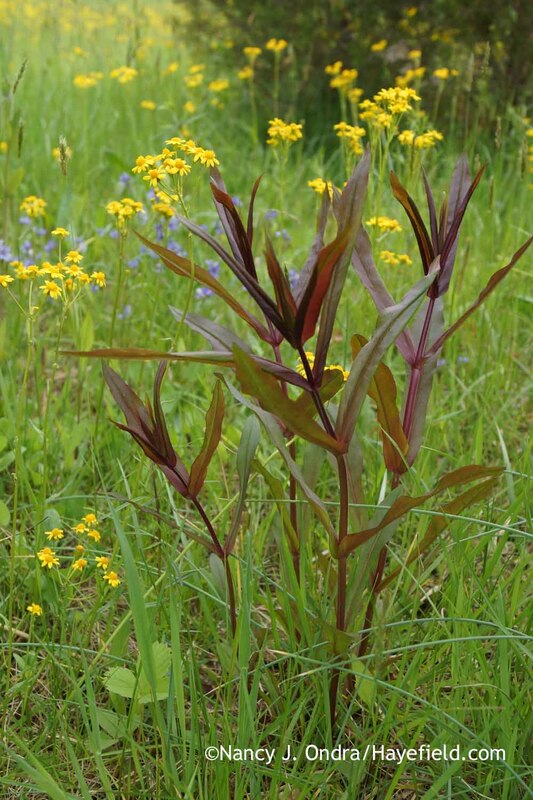 (Female plant is in the foreground; male plant is behind.) Still, you need both kinds to get seeds! 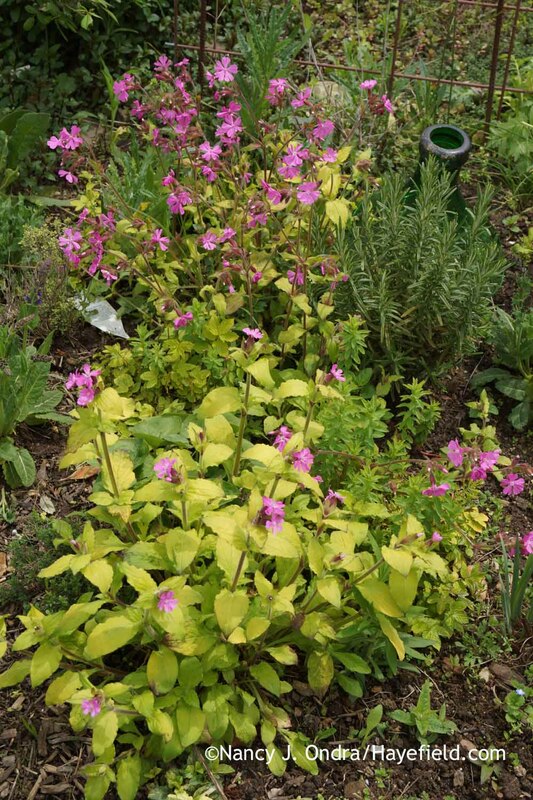 Since I like ‘Ray’s Golden Campion’ (Silene dioica) so much, I decided to sow some ‘Ray’s Winter Cream’ last year. I don’t care for it much, though: the plants were kind of sickly looking. 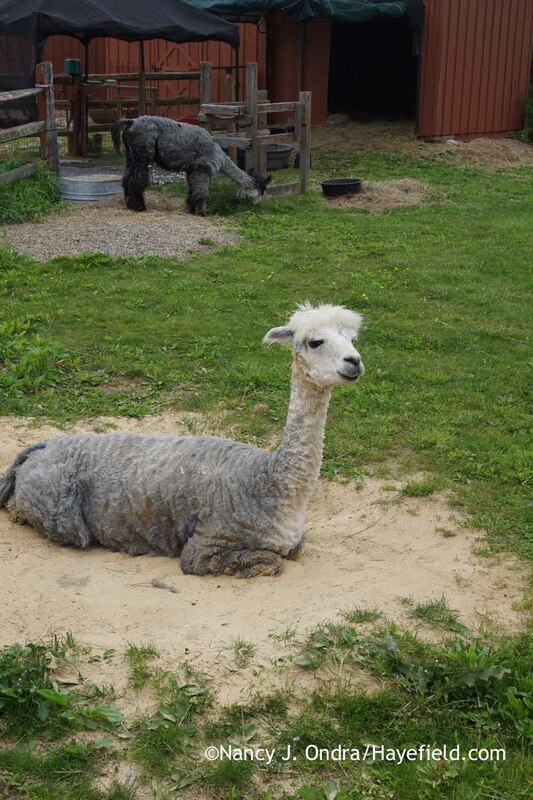 I ended up with all males, anyway, so I won’t have it self-sowing. 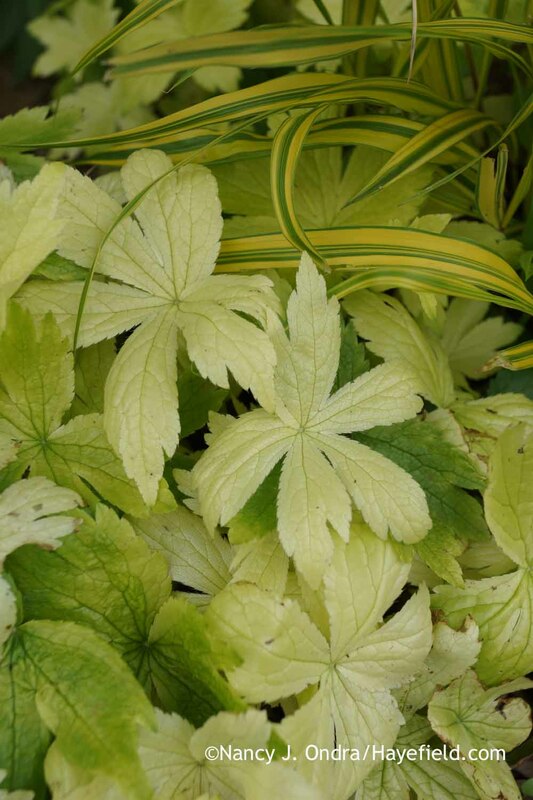 While we’re on the subject of foliage…lovely leaves are another delightful feature of the garden this time of year. Consider this part an early entry for Foliage Follow-Up, which is hosted on the 16th of each month by Pam at Digging. 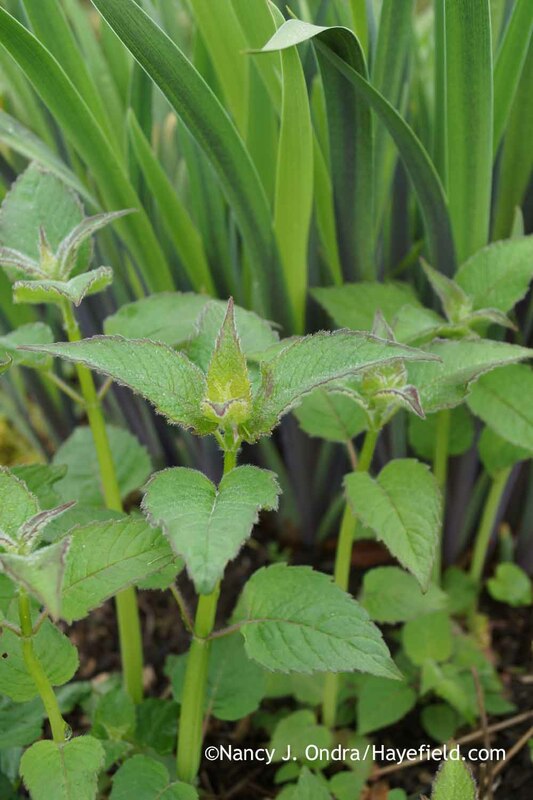 I started seed of ‘The Flasher’ Maltese cross (also known as Lychnis chalcedonica ‘Variegata’) last summer. Only about a third of the seedlings showed any variegation. 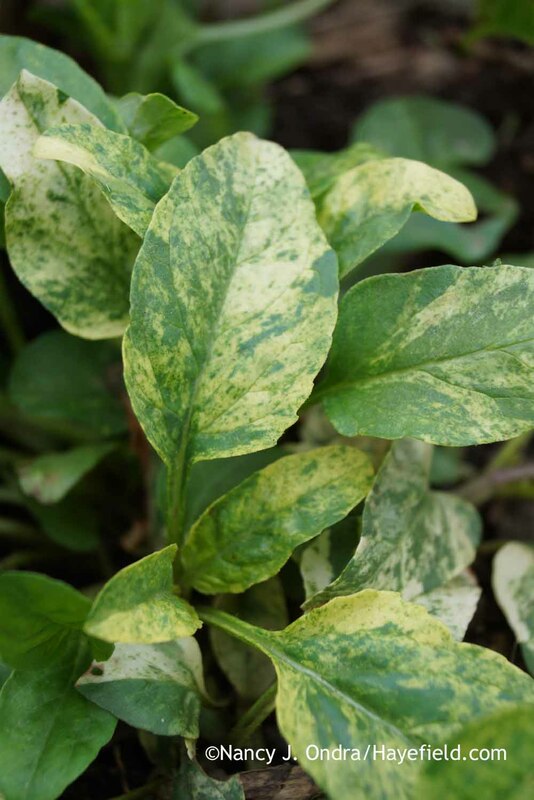 Of those, their markings this year are very dramatic but also quite unstable: There can be solid green and solid white shoots as well as multicolored ones on the same plant. Thanks to the cool weather in the last few weeks. ‘Gerald Darby’ iris (Iris x robusta) is still showing a good bit of purple in the foliage. 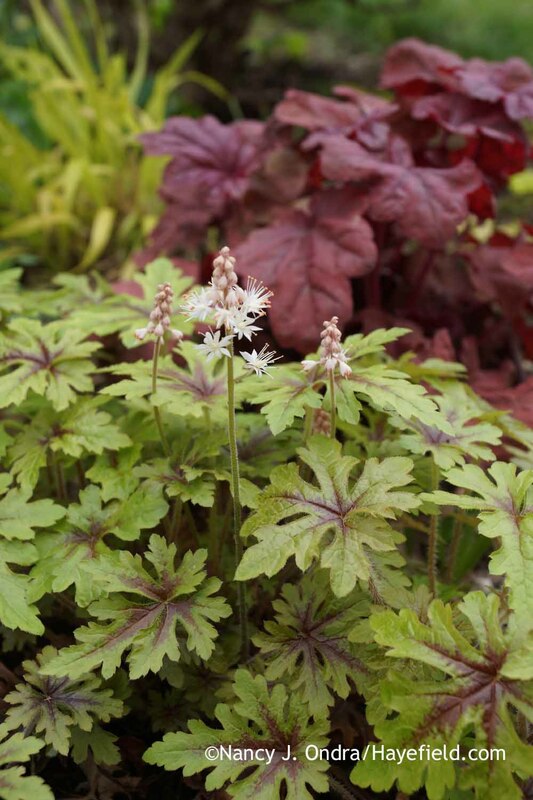 By the way, if you’re looking for ‘Gerald Darby’ and live in the southeastern Pennsylvania area, you can buy plants at Linden Hill Gardens, a retail nursery in Ottsville, PA.
‘Tiramisu’ heuchera (Heuchera) with Canada wild ginger (Asarum canadense). I’m really impressed with this heuchera: It’s been in the ground for 4 years now and keeps getting better every season. 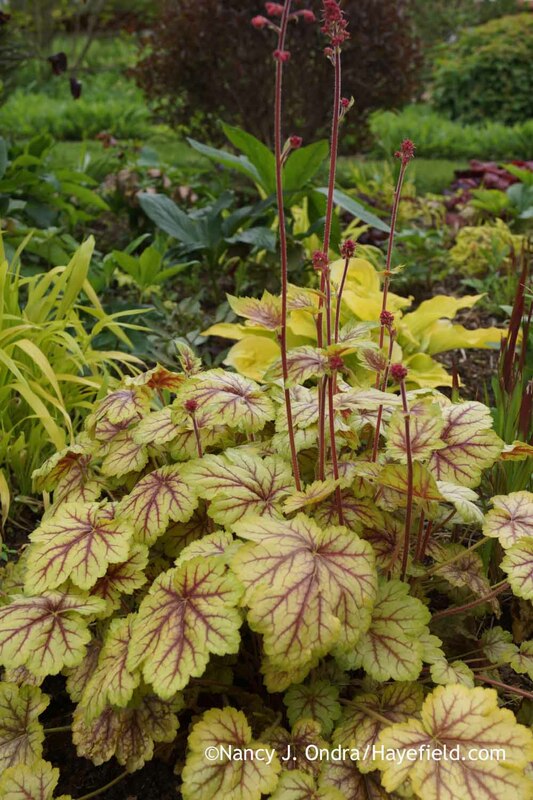 ‘Circus’ heuchera (Heuchera) has also performed beautifully here for a number of years. 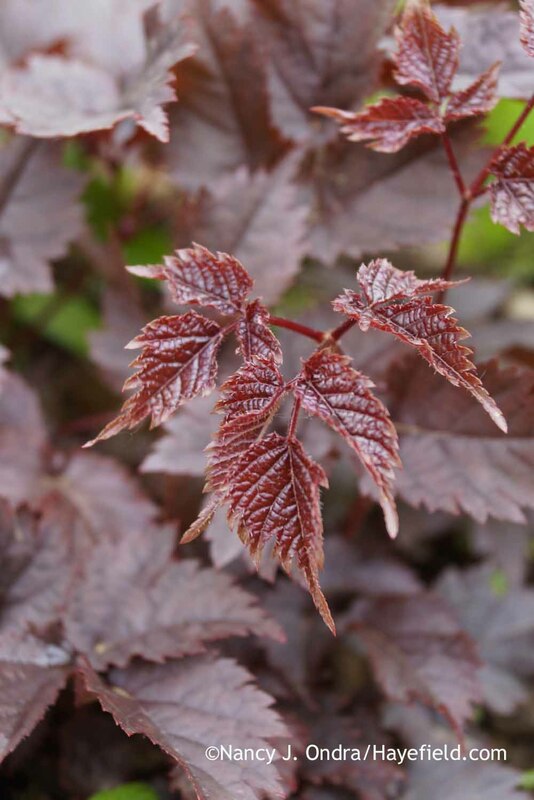 Yay – the ‘Chocolate Shogun’ astilbe (Astilbe) made it through the winter just fine and is producing lots of richly colored new growth. 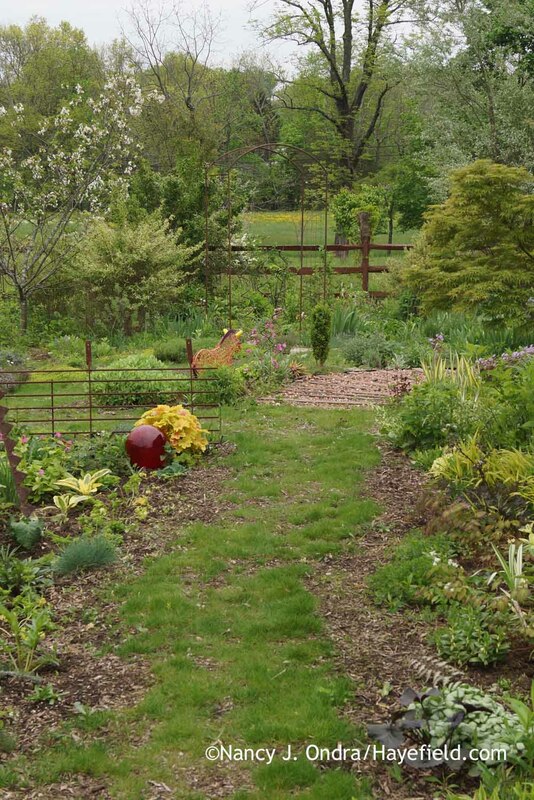 And to finish, some general garden shots. Let’s hope this is a sign that the dreary, cool days are almost over so the growing season can really get going. 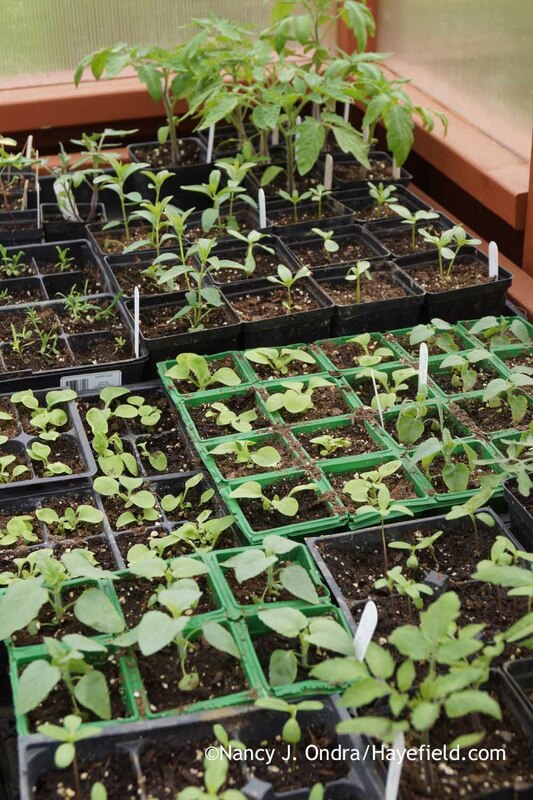 There are a lot of seedlings still waiting for their permanent homes, but they’ll have to wait a few more days, at least, as we have a few more chilly nights to get through. 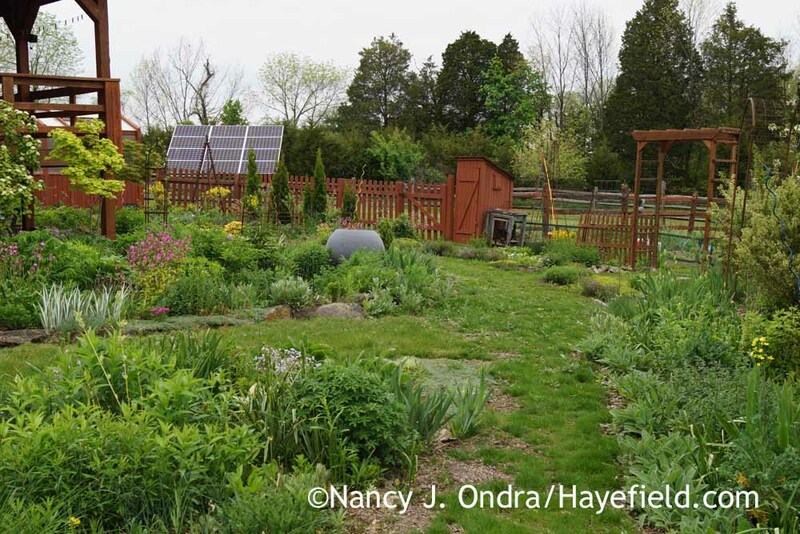 Once planting starts, it’s going to be really hectic in the garden, so for a while, I’ll be posting here only on the 15th of each month for Garden Bloggers’ Bloom Day (graciously hosted, as always, by Carol at May Dreams Gardens). If I have bits of news in between–new seeds listed in my Etsy shop, for instance–I’ll feature them in the “What’s New at Hayefield” box at the top of the sidebar on the right. See you next month, my friends! While I’m busy transplanting seedlings, collecting seeds, and weeding, certain others around here will be taking it easy. As usual. You’ve done it again, Nan! 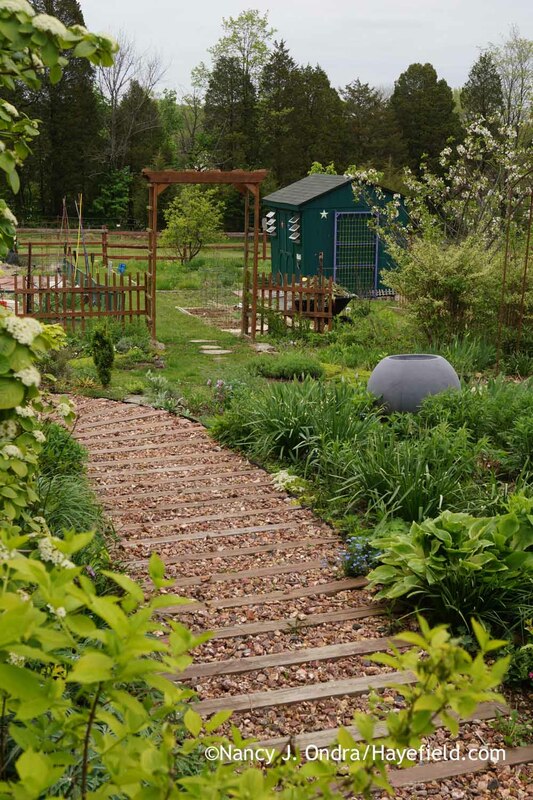 I always find inspirational ideas for my garden when I read your posts. 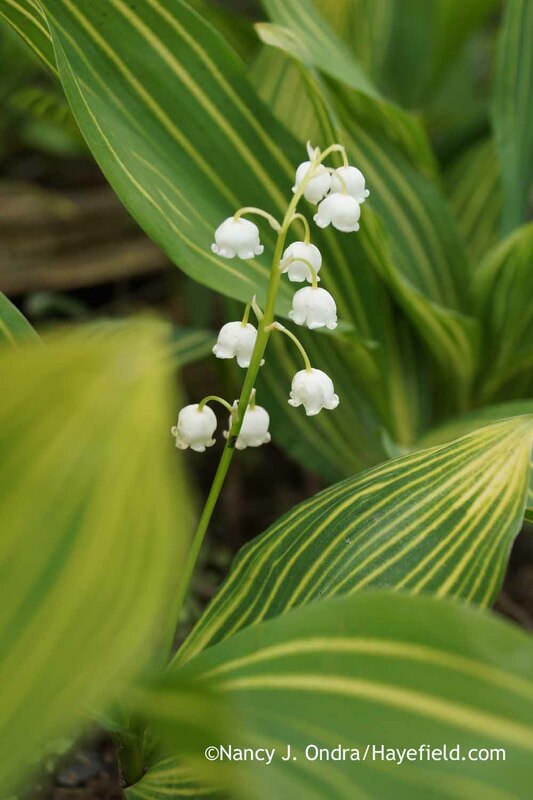 I am going to copy your pairing of the wild ginger with the variegated Solomon’s Seal. I have viewed wild ginger as a weed and have pulled every clump that has come up in my beds. 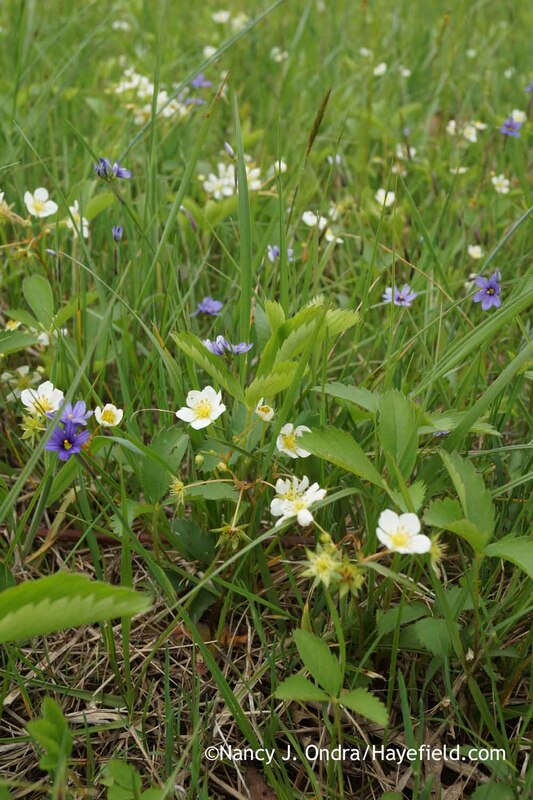 I admired it’s beauty out in the uncultivated area of the yard but never dreamed of letting it grow in my garden. My Solomon’s seal is growing on a slope among the greedy roots of a maple tree. Wild ginger is probably the only thing I will be able to get to grow as a companion. Even the periwinkle vine I tried to get established there failed! I failed miserably at caring for my seedlings of the Rays Golden Campion seed you sent me. Only a few seedling survived my neglect under the grow lights inside, and only two of those were golden. I’m keeping my fingers crossed that I have a male and a female. 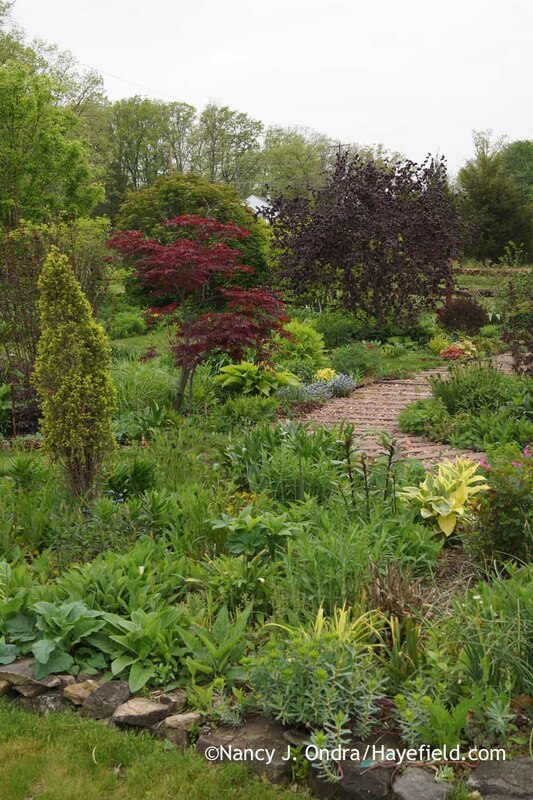 In the meantime, I just went out and sprinkled the rest of the seed directly into a patch of dirt in my border. Maybe nature will succeed where I failed. Hopefully it’s not too late in the season. 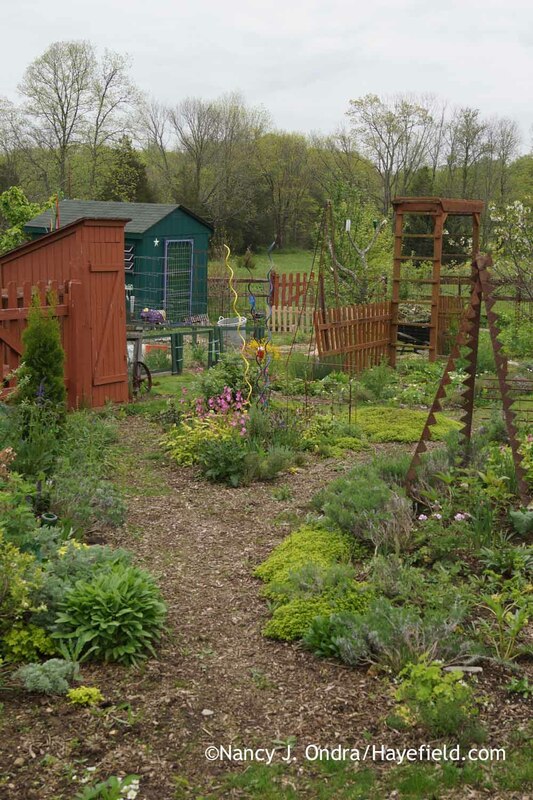 Thanks for sharing your garden and knowledge with us. Hi Debbie! I wish you good luck getting the wild ginger going under your Solomon’s seal. I’d be very interested to hear how it turns out for you. I planted the ‘Striatum’ with my Asarum canadense at the same time, and they’ve been evenly matched for vigor since then. 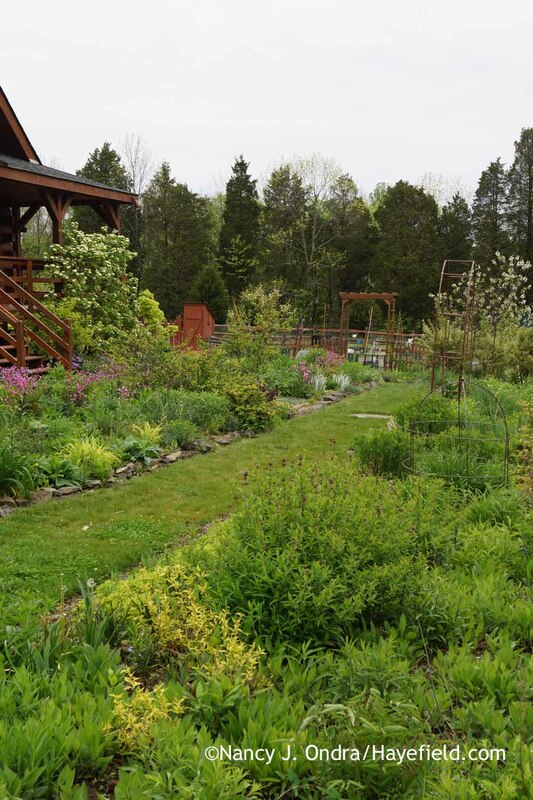 It’ll probably be trickier getting the ginger into an established patch of Solomon’s seal, but it sounds like you have plenty of plants to work with. Let me know if you need more seed of ‘Ray’s Golden Campion’, ok? It looks like I’ll have a lot of fresh seed later this summer! Well now I feel silly! What I have growing in my yard is not the wild ginger you have in your Solomon Seal photo. It’s a wild violet! 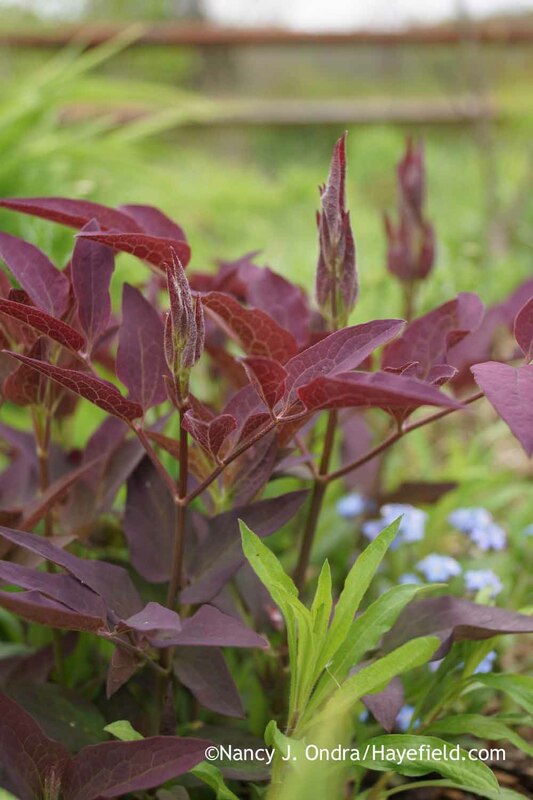 I did some google research on wild ginger and noticed there were no pictures of it with the pretty purple flowers like the ones in my yard have. Their leaves are similar. I wondered why you wished me luck getting it established in my Solomon Seal patch. The violets I have never have a problem taking up residence anywhere! 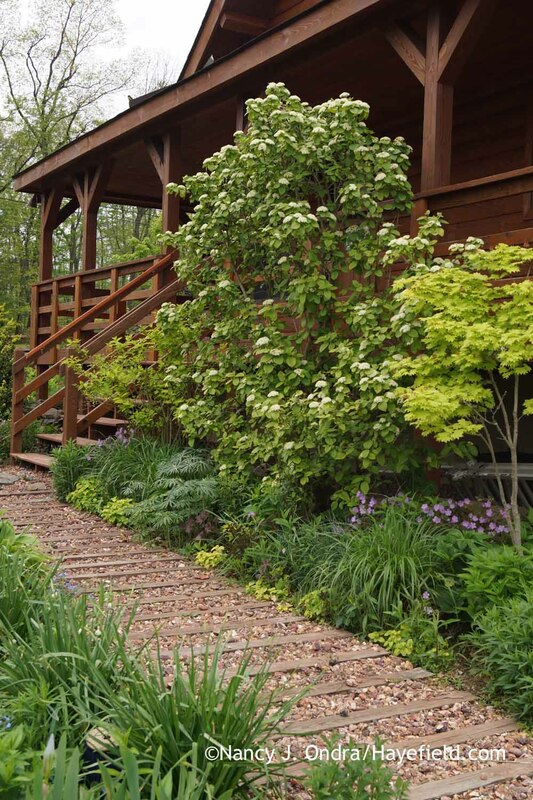 I wonder if I would regret letting the violets get a foothold among the Solomon Seal? Don’t feel silly! Now you know what it is, anyway. My wild gingers (especially Asarum canadense) have been seeding around and spreading freely, so it’s certainly possible that you could have had that much ginger. 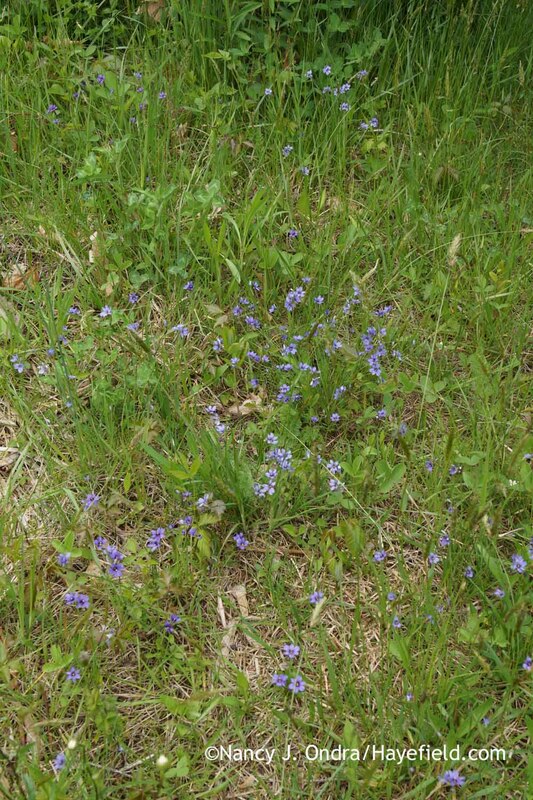 I don’t think it would be a bad thing to try moving some of the violets into your Solomon’s seal patch. If they take, it would be very pretty, and if not, you’ve not lost anything but a little time. By the way, I wasn’t being sarcastic in wishing you good luck: It’s handy to have on your side when moving anything! So lovely, It’s going to be a great year in the garden! I think so too, Julie. Best wishes to you and yours! Your post is just what I needed. Just beautiful. I’m sitting here peering out my window, watching it snow. Huge big snowflakes kinda snow. Bah hum bug. Oh nooooo, Mel – snow?! What a crazy spring. Our last actual frost was almost a month early, but your cold weather is coming our way and we may be flirting with frost tonight, which would be devastating. Let’s hope that the weather finally settles soon so we can really get this season going! I think my comment went to the ethers when Word press told me to log in…sorry if this duplicates. Cold weather coming to Ohio tonight, too. I’m counting on my somewhat urban garden to be warmer tonight than the forecast 36 degrees. Your photos and plants are amazing! 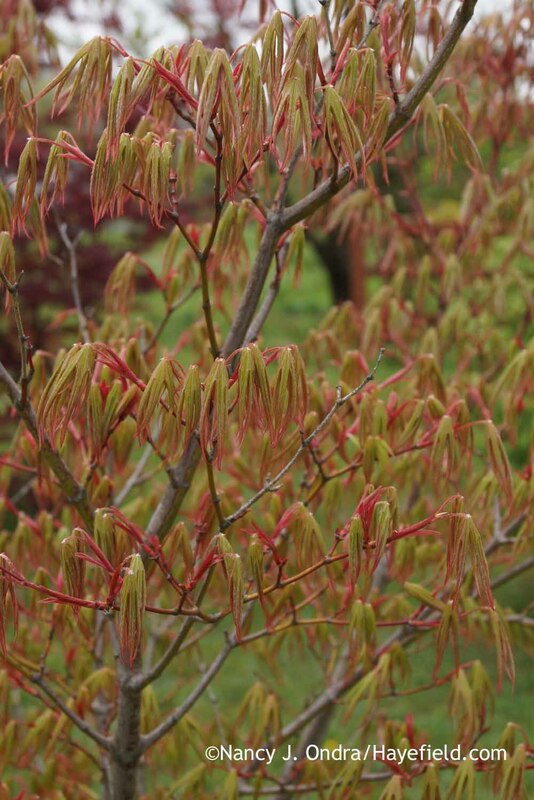 Those shagbark hickory shoots are so very elegant and you’ve definitely given me another reason to move Syneilesis up to the top of my ‘want’ list. I took a lot of photos of my Ashodeline lutea, similar to your photo, trying to capture just how almost metallic gold the nascent bloom spike is. I love the tousled foliage, too. I got great germination from the black cotton seeds I bought from your Etsy store and they are waiting to get out into the great outdoors; thanks! Hey there, Tim. Great to hear from you. Sorry about the problems you had commenting; WordPress does that to me too; very annoying. 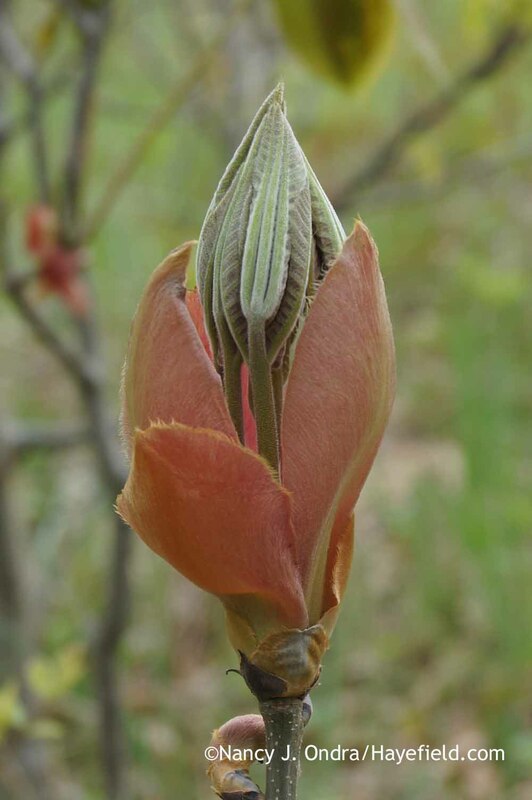 Anyway, I’m glad you too enjoyed seeing the shagbark hickory bud and shoots. They are as dramatic as any tropical. 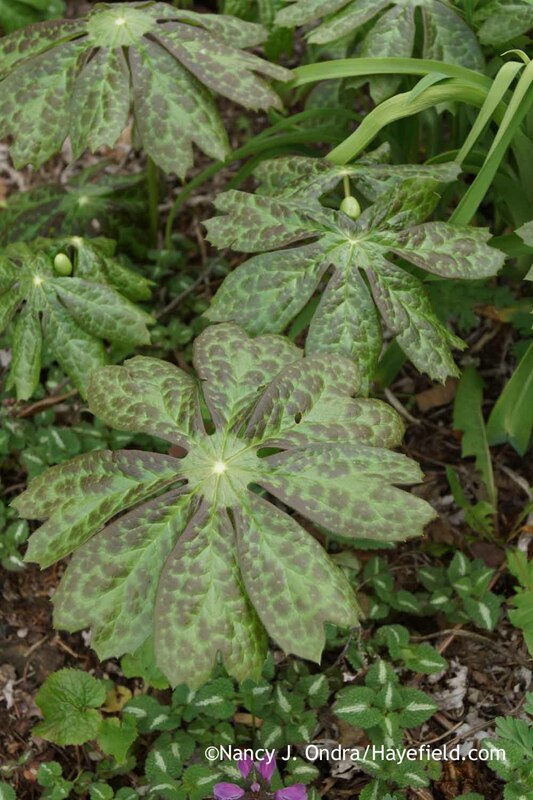 The Podophyllum plants were indeed originally from our woods, and yep, the markings are less prominent now that the plants are in flower. Thanks for the great news about the black cotton seeds. I had 100 percent germination on the two small batches I sowed. Maybe I should clean some more for sale…. 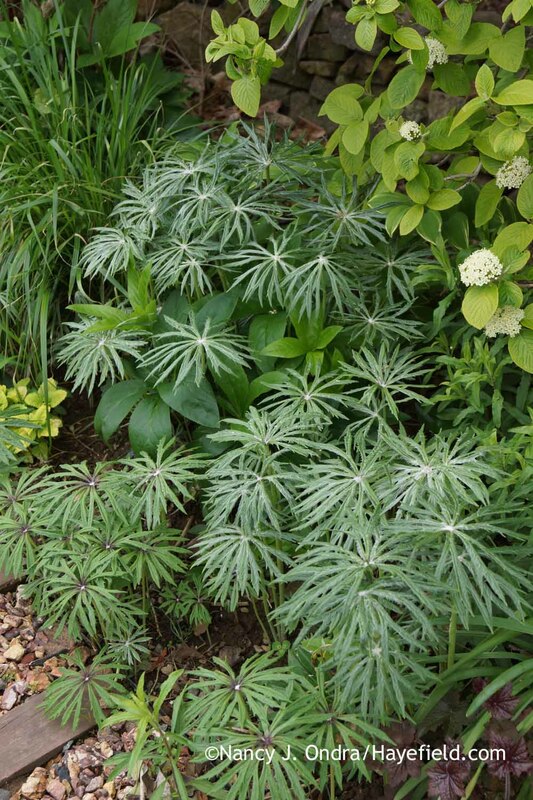 What a wealth of fascinating plants and as always your wonderful combinations. 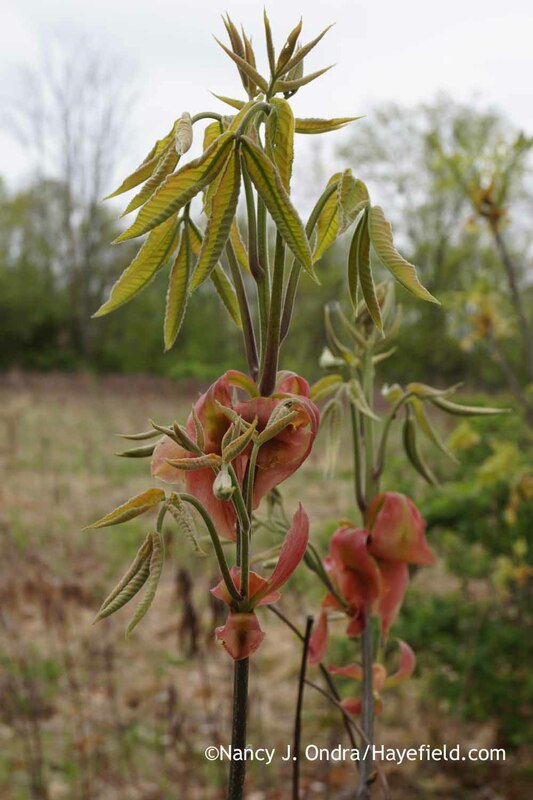 The Shagbark Hickory has to be as pretty as any flower. 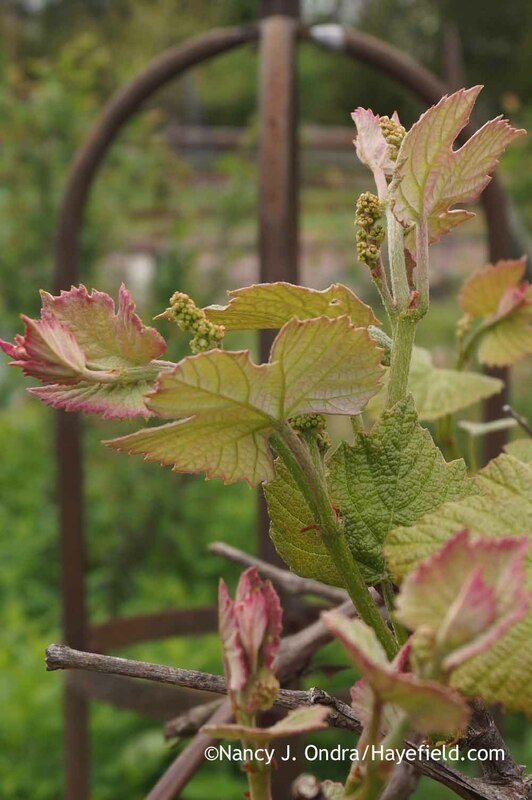 What a great look as those leaves unfurl. 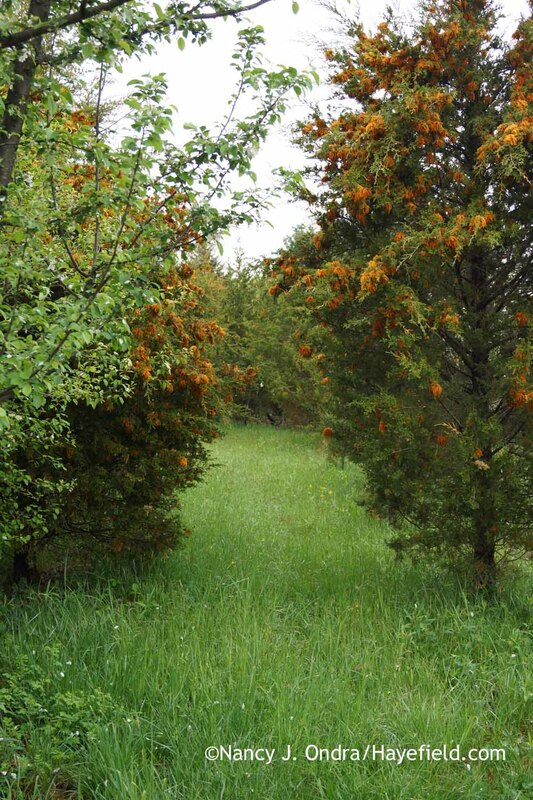 We’ve had that cedar apple rust in the past when we had old plants of each in the same area. They’ve been long gone and I’d forgotten what a mess that can be. I’m just dealing with some tent caterpillars which seem tame by comparison. Thanks for stopping by, Linda. Ah, you know the joys of cedar-apple rust too, huh? 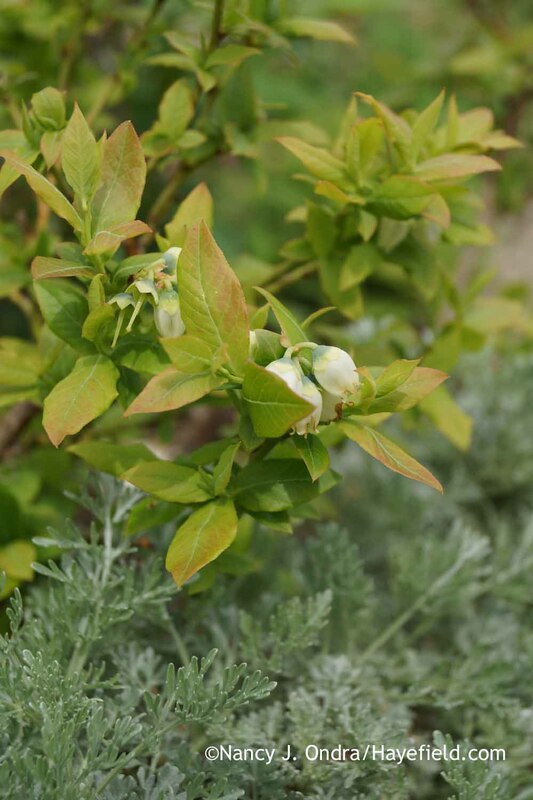 I’ve given up trying to grow apples for eating, though the apples and crabapple seedlings that come up on their own in the meadow produce thriving, vigorous trees that flower well and set lots of (basically inedible) fruit. The tent caterpillars will come along soon enough here; thanks for the reminder! 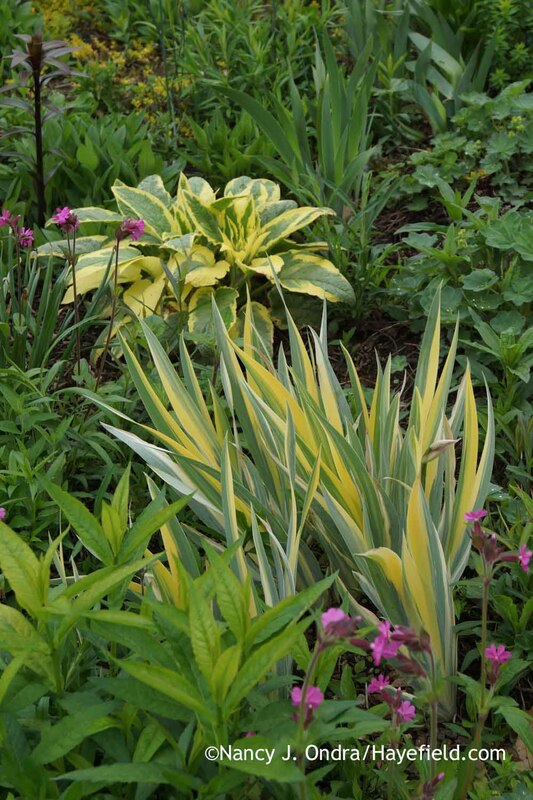 Love the variegated comfrey and variegated iris together, Nan – very striking and what a great repetition! I always get wonderful plant combination ideas from your posts. We had sleet/hail today in western PA but it might get warmer as the weather moves east towards you. 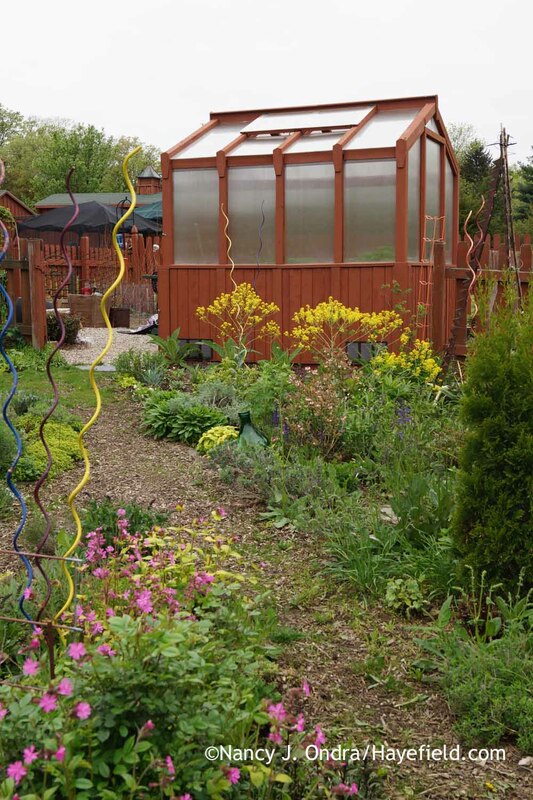 I still have tender plants under covers for now – this is the latest cold weather I ever remember having here! Sadly, it’s not getting any warmer. The sun came out for a bit, so I hung out some laundry; just sat down and had to run back out a few minutes later to save it from a sudden burst of the rain/sleet/hail. What next? We’ll be complaining about the heat and humidity soon enough! Such gorgeous pictures! I’m on vacation right now in the UK and am enjoying the glory of both gardens and wild areas but your post made my fingers itch to get going in the garden as soon as I get home! I had a golden full moon Japanese maple years ago but it died. I am determined to track another one down now. Thanks as always for the inspiration! 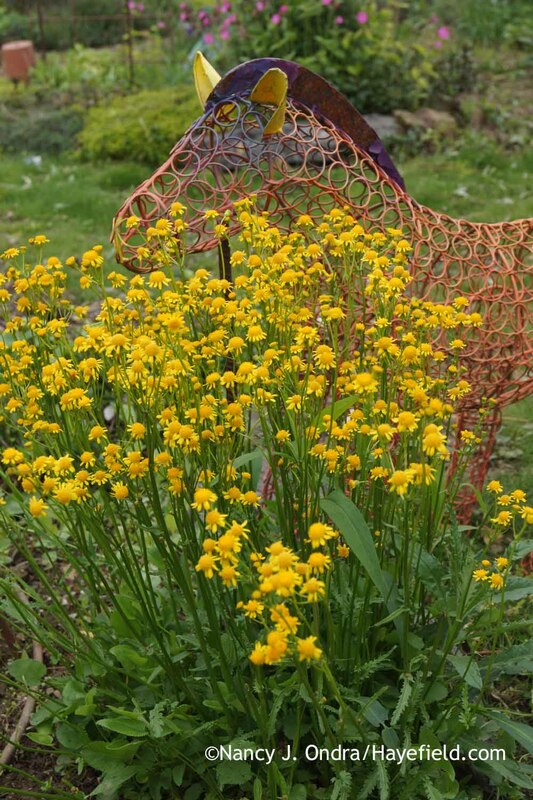 You’re touring gardens in the UK and looking at gardening blogs too? You are truly dedicated! Have a wonderful time, and rest up if you can so you’ll be ready to get to work when you get back. Fantastic show! You should post a warning – I always leave here with a new plant wish list ha ha! 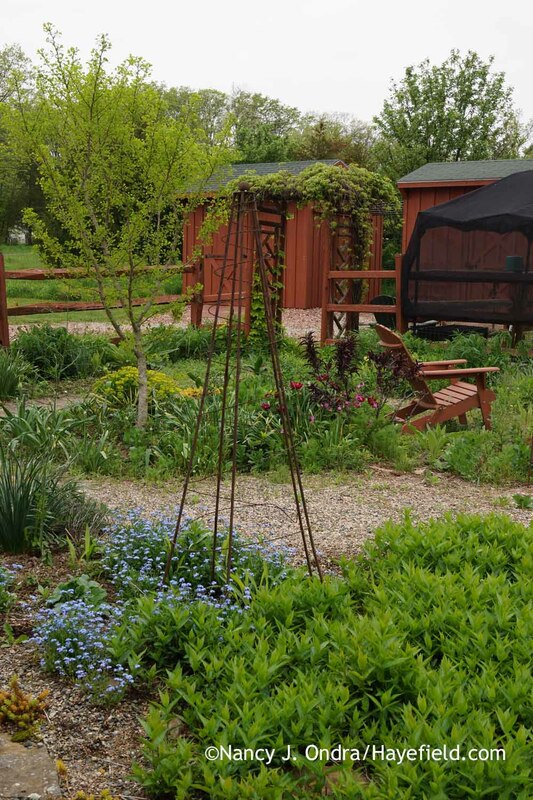 Absolutely love your gardens – wild and tame. Sorry/not sorry about that, Kathy. 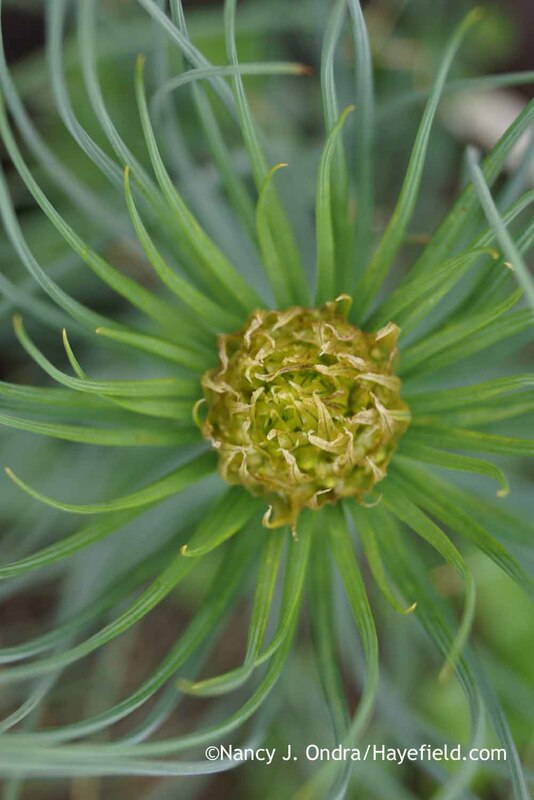 Isn’t it a joy to discover wonderful new plants to track down and try? Happy Bloom Day! 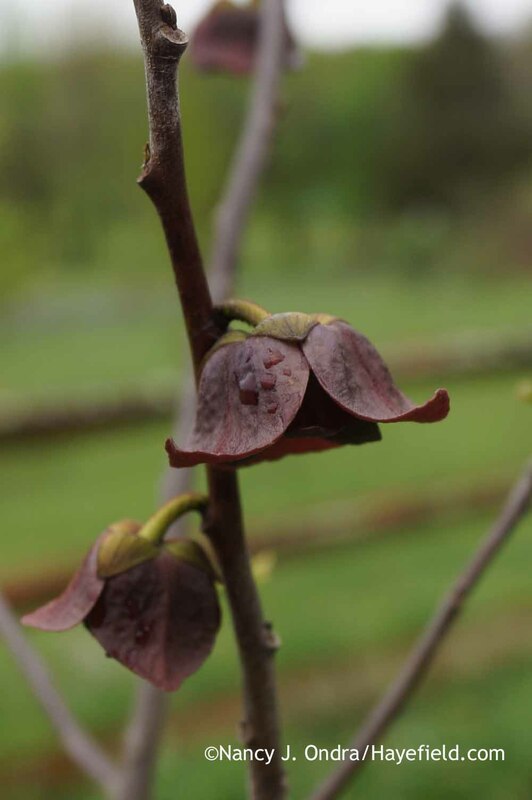 Loved the shagbark hickory and the pawpaw flower. It’s so easy to forget to see the things that grow naturally around us, so thanks for the reminder to let those into our consciousness. 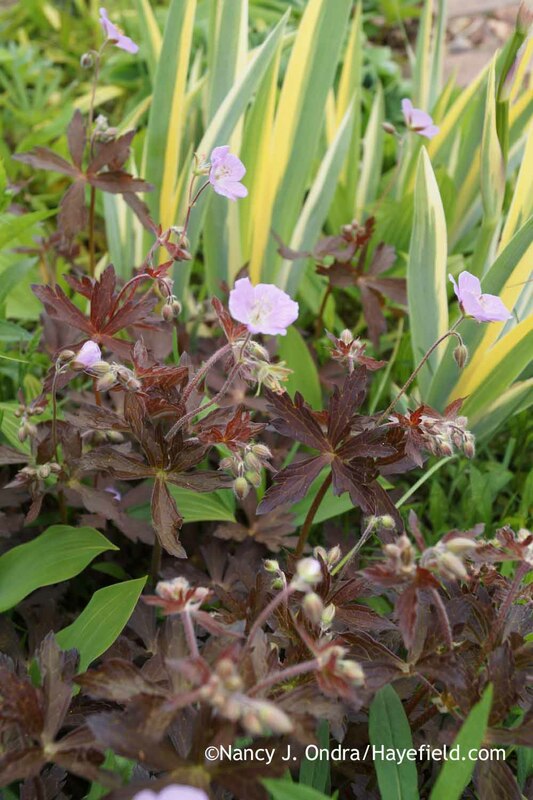 You have so many beautiful plants, but I positively gulped when I laid eyes on that Tiramisu heuchera. Not sure why, but I seem to have been on a yellow kick lately… Each year is different I guess. Maybe this year, yellow is it for me! I highly recommend ‘Tiramisu’, Anna. 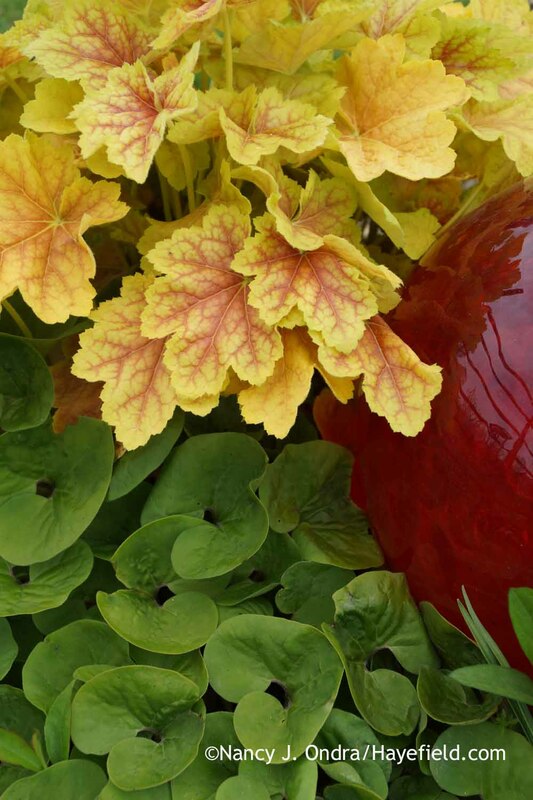 I’ve tried a lot of heucheras over the years, and not many turn out as stunning as their catalog pictures, but this one has been a winner for me. So much to look at in bloom. 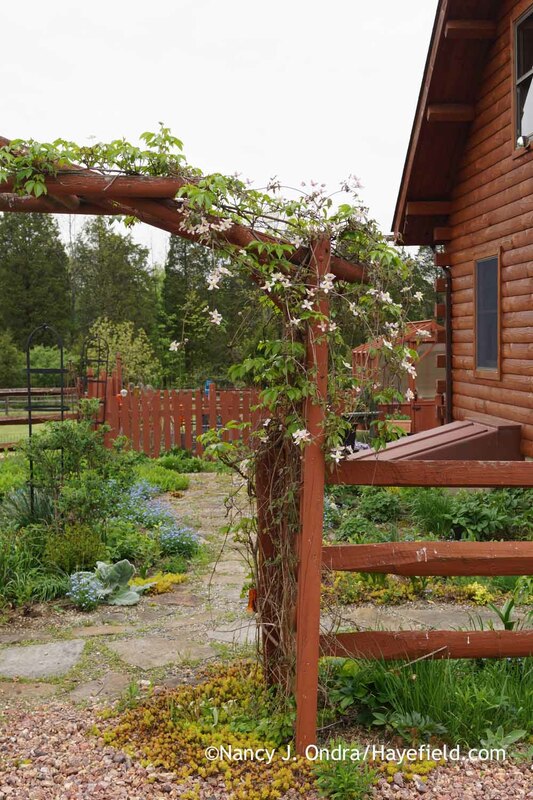 I knew that was cedar apple rust on the first glimpse of the first photo. I never saw so much healthy fungus! That violet was very intriguing. Well, if you’re going to have something like cedar-apple rust, you may as well have a lot and make a real spectacle out of it, right? (As if I have any control over it one way or the other.) Thanks for visiting, Ray. 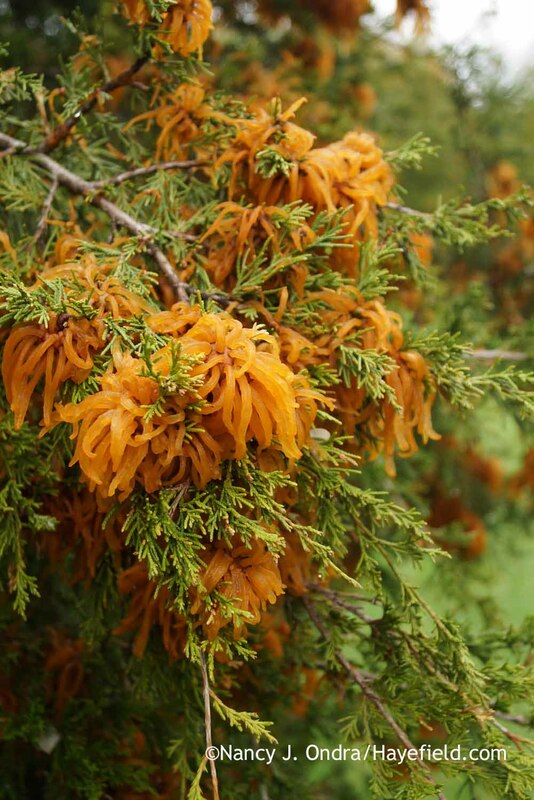 So many plants I can’t grow but at least I don’t have to deal with something like cedar apple rust – yuck! I hope you warm up soon – but not too much too fast! Happy planting. Hi Kris! Yes, I’ll probably be moaning about it being too hot and dry in my next Bloom Day post. For now, I’m moaning about the frost we had last night and wondering what damage I’m going to find once the sun is up. Such beautiful plant combinations. I really liked the top view of the Canadian lousewort – what a unique spiral pattern. Thanks for sharing, and happy bloom day! Thank *you* for visiting, Renee. 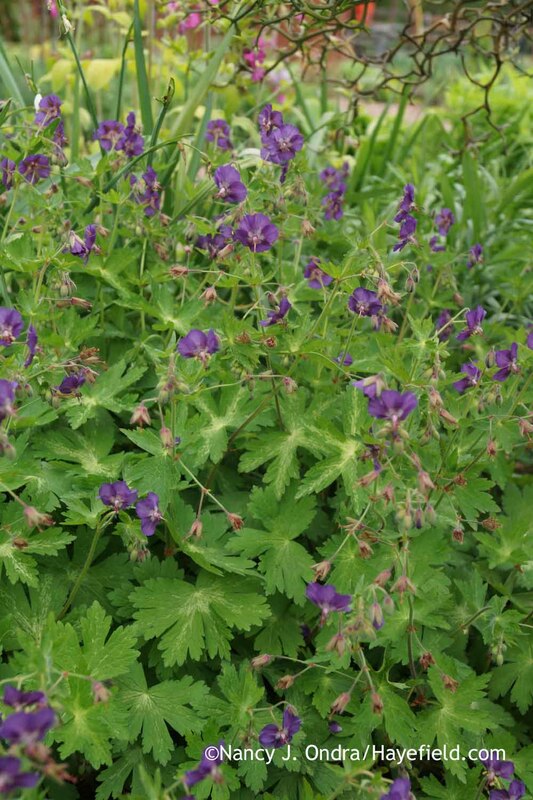 I’m glad to hear that you too liked the lousewort. 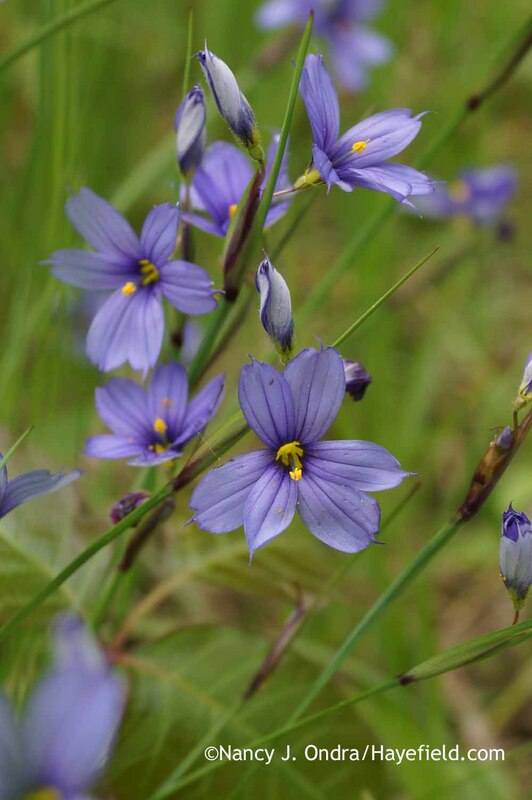 It’s such an interesting and attractive plant that it deserves a nicer name. You are so kind, Nada, to leave such a lovely comment and generously offer seeds as well. 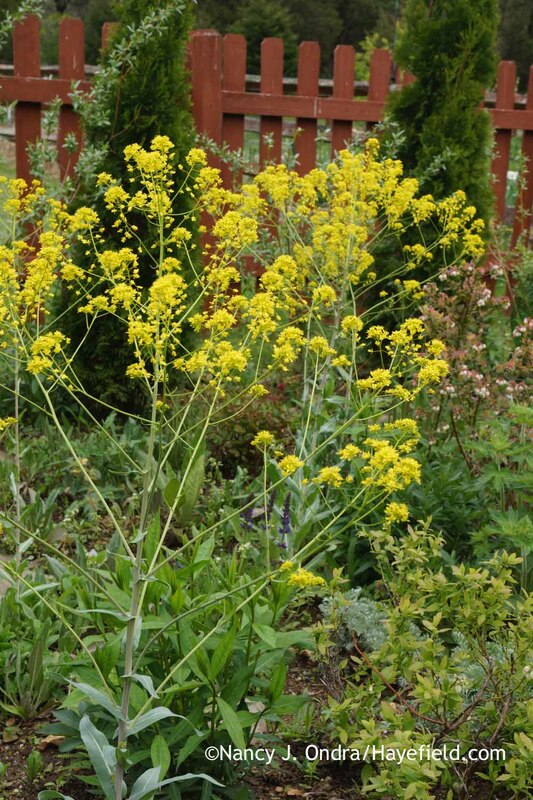 I *think* I may have finally succeeded in getting the golden Alexander established in various spots at a variety of stages, to the point where I will have flowering-sized plants each year from now on. Time will tell…. Whew, after bending over and hand weeding most of the day it was pure joy to view your lovely blooms! Thank you a bunch. Good to hear that you had a productive day too, Mary. I’m looking forward to the warmer, more settled weather that should be coming by next week, so I can get some of your seedlings planted out. 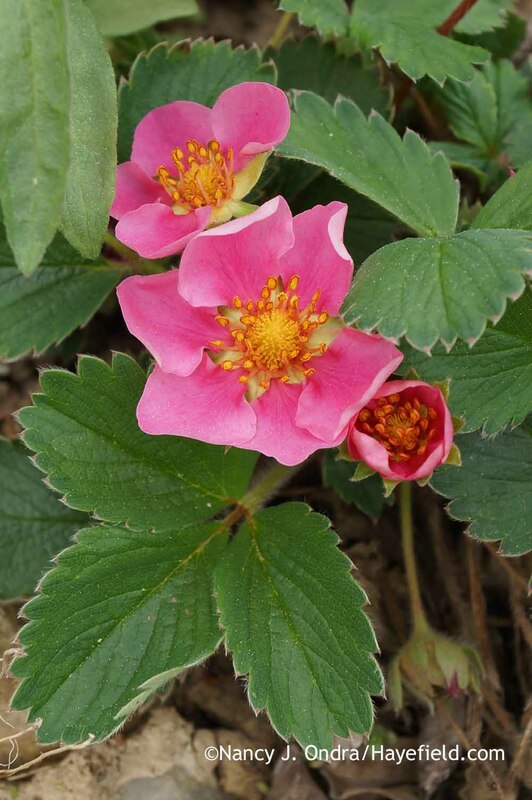 Hi Nan, you really do spoil us with such lovely photos of your plants, garden and wilder parts, plus your comments which are always interesting. Well I never knew that, about Rays Golden Campion, even though I have been growing it for years. 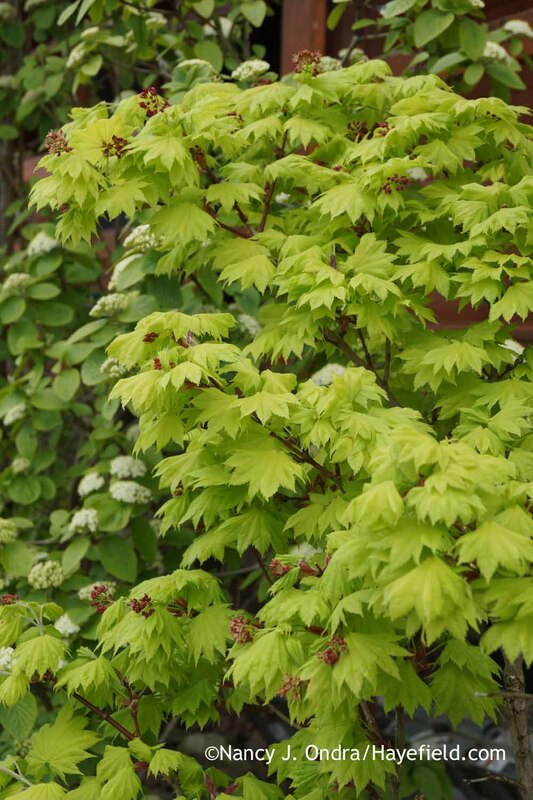 I shall now be going round my garden trying to identify which is female and which is male (when they come into flower) lol.Im copying you again, last weekend I purchased a half moon maple, I couldnt resist it, last one in the nursery too. I’m so pleased that you found that bit about the red campion of interest too, Allan. You must be a bit behind us this spring, as my plants have been blooming for about 2 weeks now. Congratulations on your new acquisition! It’s not a speedy grower but worth the wait. Aw, that’s sad, Julia, especially about the Aralia. 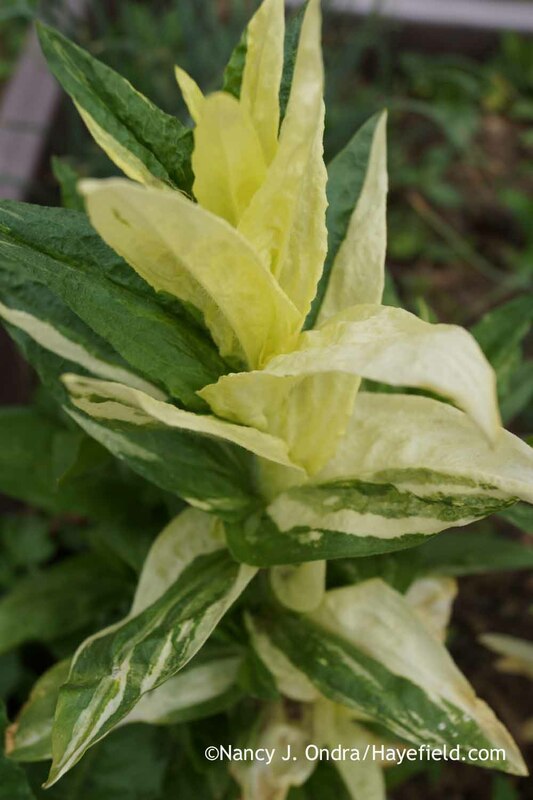 I’d dearly love to grow ‘Sun King’ but have trouble getting it past the first winter, for some reason. Hi Drew! 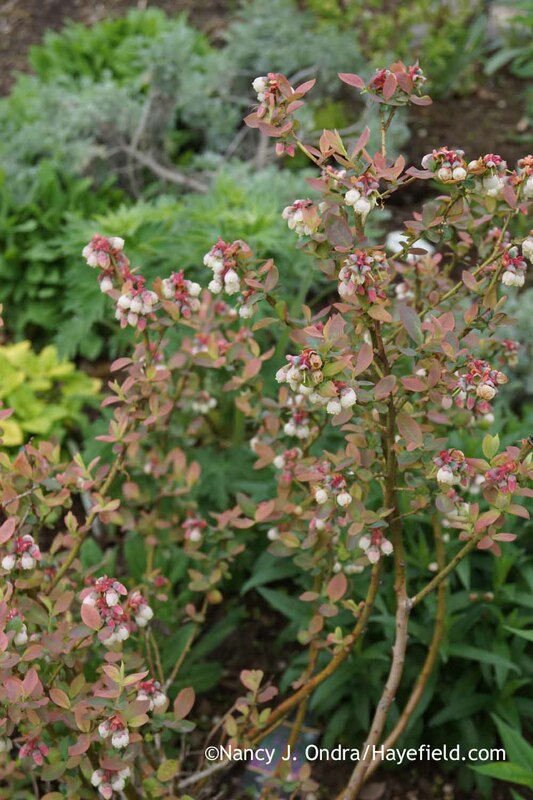 It’s a beauty at any stage, but the huge buds on those vigorous, self-sown seedlings were truly memorable. As always, you are the Queen of plant combos! I love that you love the natives too. 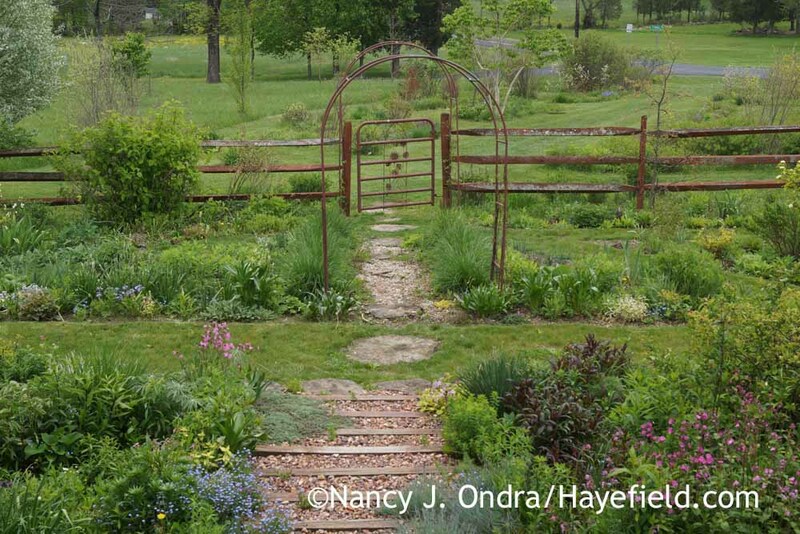 Maybe your next book can turn the world on to native garden combos ;) I also loved the “Lama In A Field” picture. He looks so happy! I have been thinking about adding the Green And Gold but wondered if it was truly deer resistant and how quickly it spreads? Thanks, Kimberly! I’m afraid that I can’t give you a definitive answer on either of your questions. I have my green-and-gold inside the fence, so deer don’t get to it. 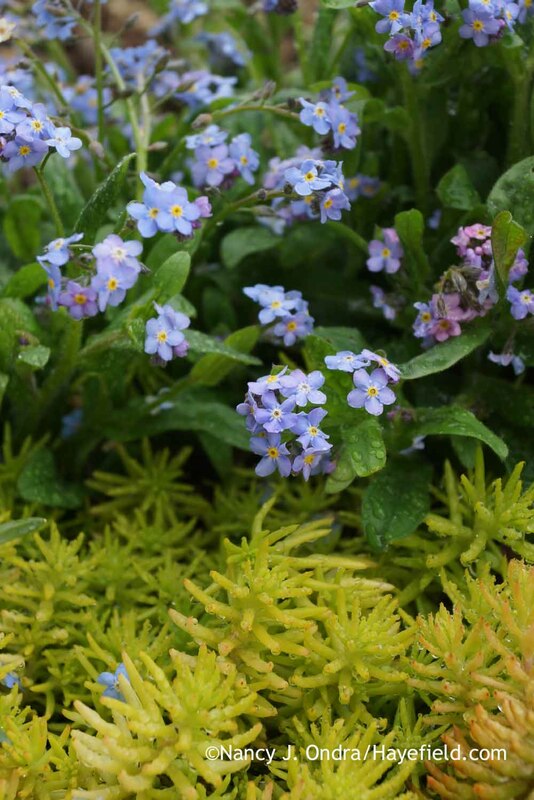 As to how quickly it spreads: well, it does a good job at being a groundcover, but whether that’s a boon or a bane depends on the relative vigor of what you want to plant it with, and where. 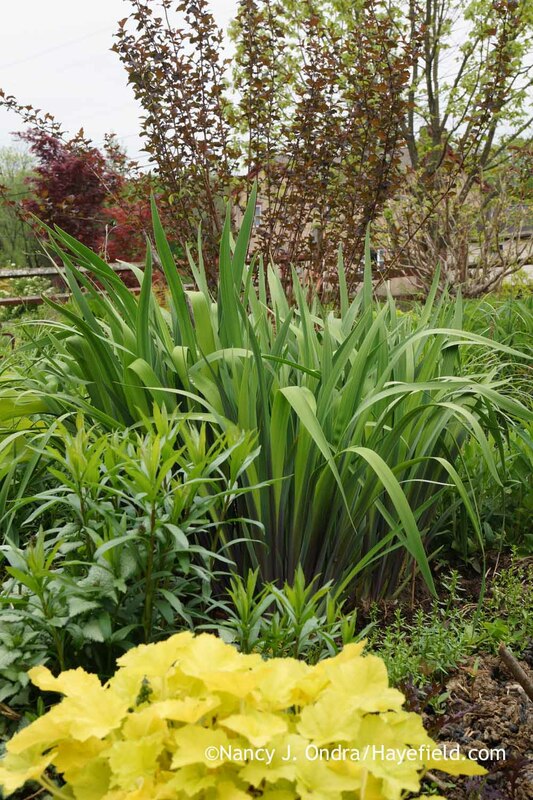 In a tiny bed, or with something like a dwarf hosta, probably not a good choice; under a bunch of shrubs, or with medium-sized to large hostas, I think it would be great.